Sudan was always intended to be just a country we had to go through to get from Ethiopia to Egypt. What I knew about the country was not much, mainly knowledge from my school days about soils, geology and the physical geography of the Nile. Of course the news at the time, and not without grounds, painted a very negative impression of Sudan. There had been a long and brutal civil war between the north and south; atrocities committed in connection with Chad and Dafur; international arrest warrants for Sudanese leaders for alleged breaches of human rights and war crimes; and a complicated history that includes the Ottoman empire, Egyptian rule and from the late 19 th century until 1965, British colonization. When we entered Sudan at Matema the country had very recently separated into a Black Christian South and an Arabic Islamic North. Clearly the Sudanese infrastructure was still rather chaotic and so we expected to be delayed with admin and paperwork at the border and we were. Arabic was now used instead of Amheric and we soon learnt the standard As Salamu Ali Kum, a commonly used and very peaceful greeting that always brought a very warm response. The people seemed very mild in temperament, friendly, calm and conservative. Chalk and Cheese when compared to the Ethiopians who always jumped about like excitable Shih Tzu lap dogs. There were of course new rules and protocols to adhere to that were unfamiliar and very different to those that I was brought up with and generally ignored during my English middle class roaming catholic upbringing. No doubt they were also very different to Fanny’s “pinko commie capitalist atheist confucian sports school” upbringing in Shanghai as well. We had been fortunate to get our visas in Nairobi, thanks to the very useful consular letter given to us by Ms Li in Cape Town (Consul General). 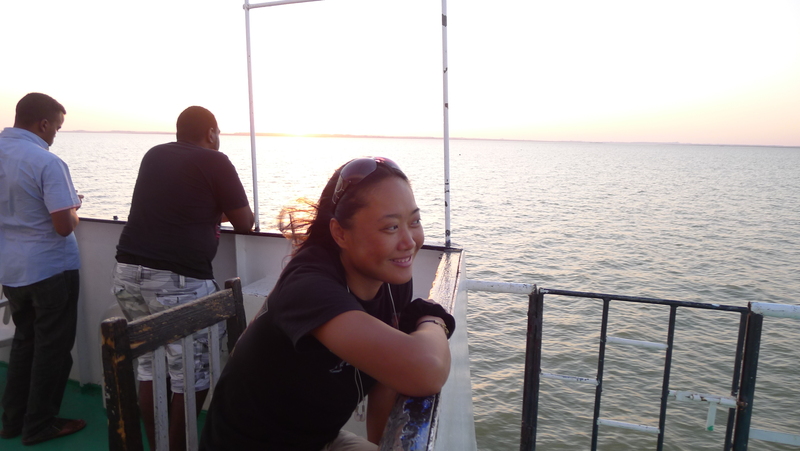 The Chinese seemed to be very much in favour in Sudan and so I would often use Fanny as our trump card, not only because she was Chinese but she was able to charm anyone we met in Sudan. VisaHQ, the UK agency I had used to get my Ethiopian visa (I had to actually send my passport back to London from Nairobi), was not issuing Sudanese visas at the time and so we had been fortunate that we had been given the letter. 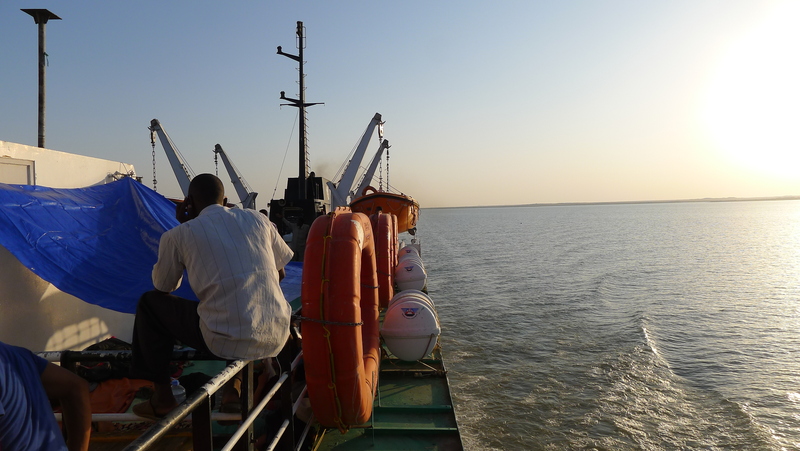 Unfortunately, the period of stay permitted by our visas was only two weeks, and it required us to further register within three days of arrival and part with even more cash at the Immigration offices in Khartoum, which would prove to be a very frustrating and tedious procedure. Its seems that Sudan is to bureaucratic efficiency what King Herod was to babysitting. 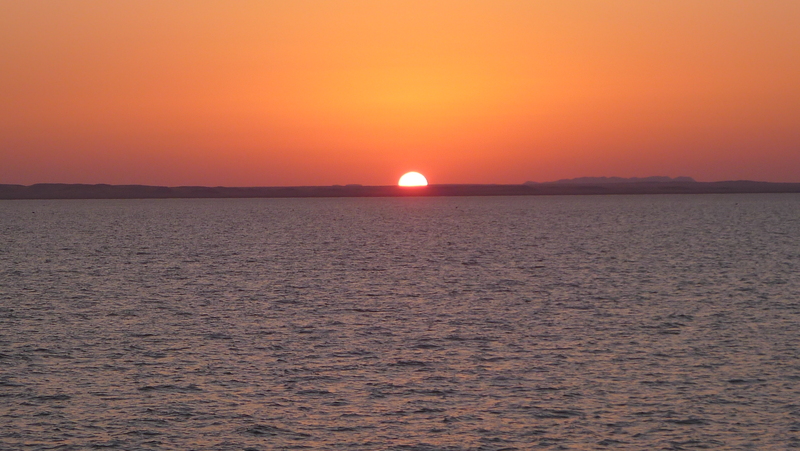 Still, it could be worse…we hadn’t been to Egypt yet! 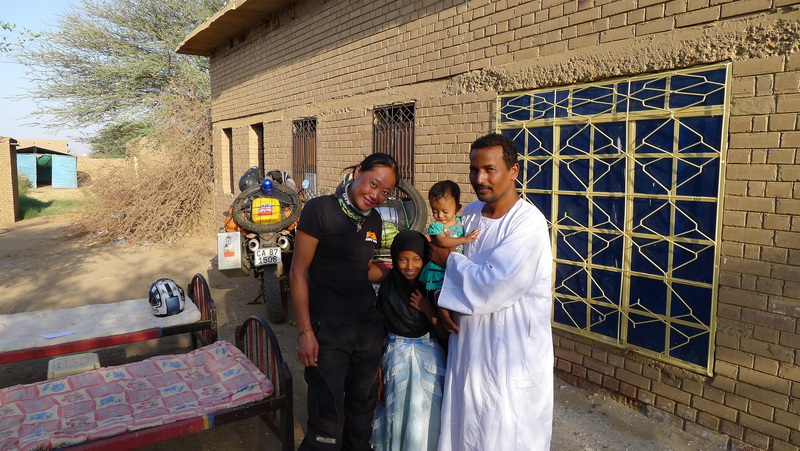 We had been told by fellow travelers we met coming from the north that Sudan was rather boring, there was very limited food, fuel and water, that it was blisteringly hot, but on the positive side that the Sudanese people were very friendly. Our experience was that only the last two things were correct and we were never sure why there was a general perception that there wasn’t any food. 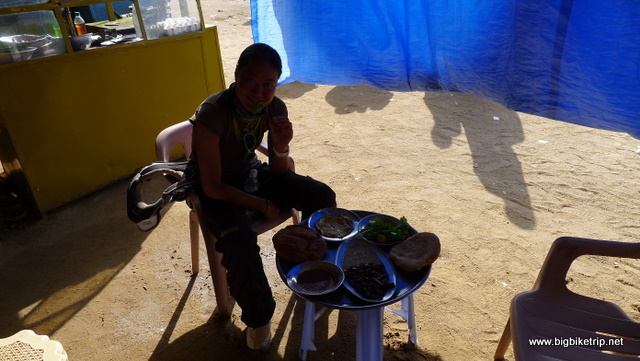 The food was plentiful, cheap and delicious, provided you like “ful“, the Sudanese version of tibis. I’ll eat anything…I even ate food from a 7-11 in America once. Anyway, the food situation was just as well because when we opened our motorcycle panniers to retrieve our precious tomatoes, cabbage, onions and chilis all we saw was a bag of hot grey slime. The temperature in Sudan was just so hot and reach up beyond 50 degrees centigrade at certain times in Khartoum. Everyone had said we had to drink lots of water and we were grateful for the 30 litre water bag the Dutch guys gave us in Malawi. Water discipline is important and you need to keep drinking large quantities of water even when you are not thirty. 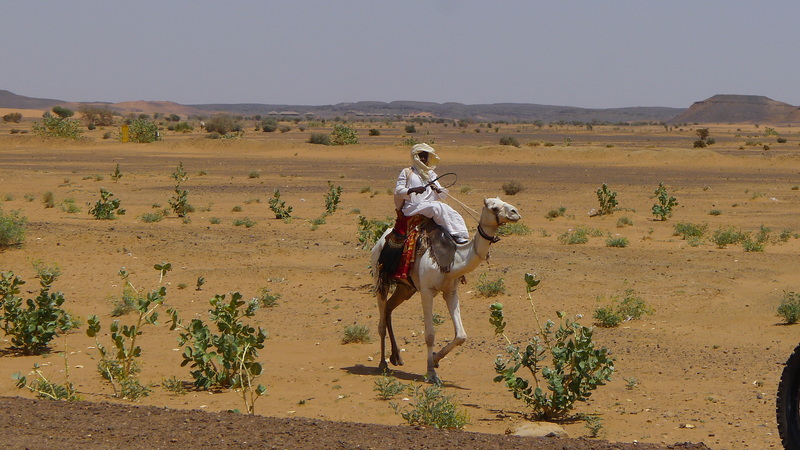 In the deserts of Sudan there appears to be no sweat on your body, but in fact you are dehydrating quickly and perspiration evaporates immediately. Fortunately, there are communal water drinking vessels and large earthen ware jugs placed almost everywhere and whilst it might be pushing the hygiene envelope somewhat, the alternative of dehydration is even more serious to health and well being and will creep up on you if you are not careful. 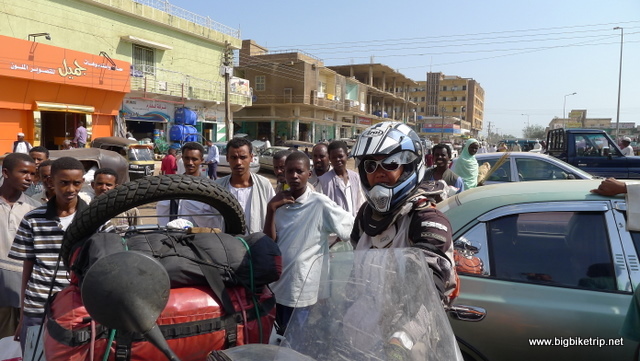 Lots of curious faces… as a woman biker in a very strict Muslim country Fanny really stood out. There were mosques everywhere and calls to prayer were five times a day and very loud. A very annoying waste of the good part of a day (out of a total of 14 permitted on our visa) spent registering ourselves and our bikes in Kartoum. Waste of money and waste of time. Delicious food .. some of best we had in Africa so far. A big surprise. Later the food in Egypt also got a big thumbs up. 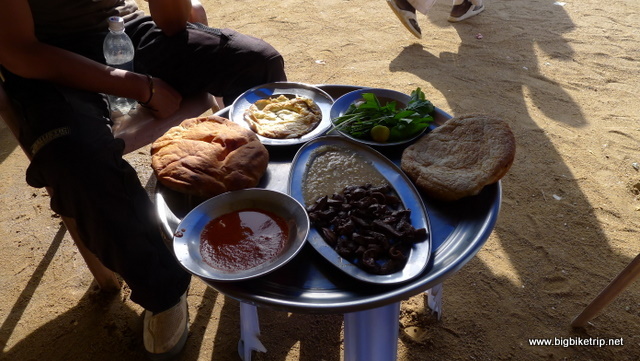 A typical meal for us in Sudan .. and setting. Couldn’t be happier. As a probationary inspector at the Royal Hong Kong Police training school in Wong Chuk Hang (Aberdeen) in the mid 80s–and I am sure my former squad mates can testify that I am not exaggerating–we used to stand to attention during drill lessons on the parade square, dressed only in baggy shorts, boots and with a peaked cap on our heads in temperatures that could reach the late 40s. It was so hot that the polish would melt off our boots and whilst standing bolt upright to attention you would have to discreetly shift from foot to foot, much like those lizards do in the outback of Australia, to reduce the heat coming up from the parade ground tarmac and scorching your feet. I can safely report that Khartoum was even hotter. It was one of the few places that the faster you rode on the motorcycles the hotter your face became. It was like putting a hair-dryer onto full blast and pointing it directly at you face for hours on end. This is why we, and the locals were covered head to foot. Far too hot to allow any flesh to be exposed to the elements. 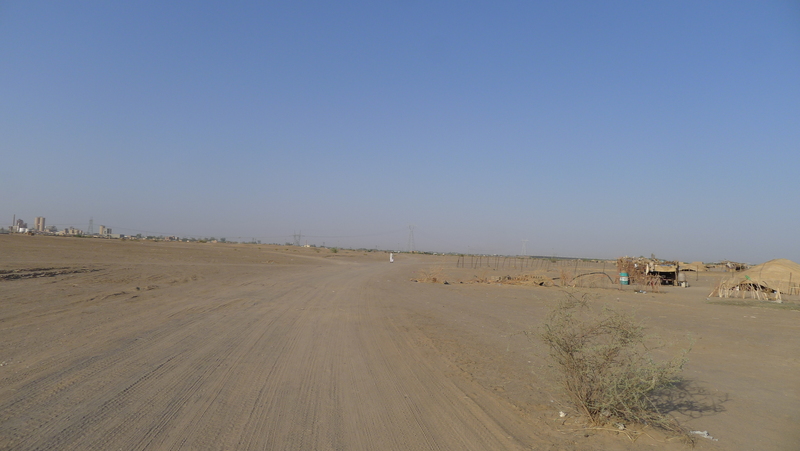 We didn’t have a great deal of time to get to Khartoum and so we set off on good roads through rather flat and featureless terrain. 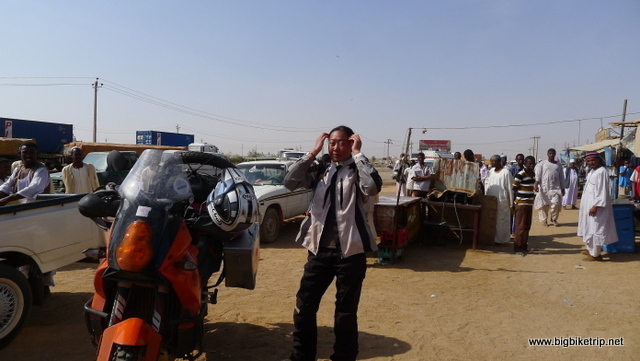 The motorcycles were going brilliantly…no problems at all. I was a bit worried the scorching heat might affect the engines but as long as we were moving along at a good pace and getting air across the radiators the temperature gauge seemed to be OK. Whenever we stopped of course it made sense to switch off the engine to prevent them overheating. 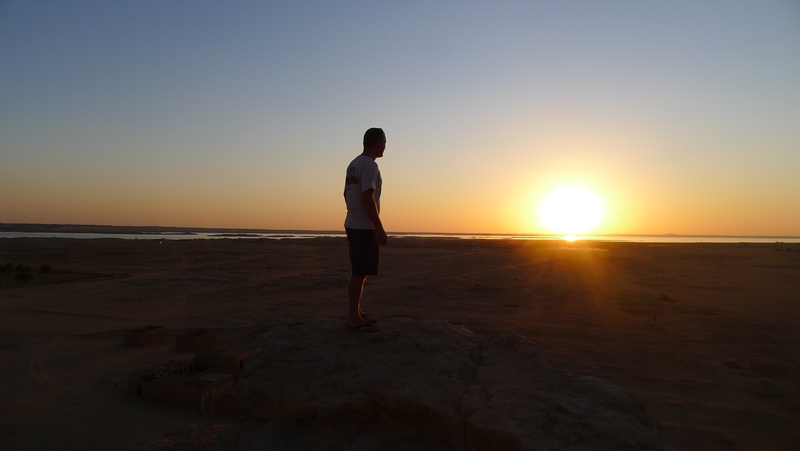 We got to a town called Al Qadarif (Gedarif) as the sun was going down and searched the GPS database for a place to stay. I had wanted to bush camp, but the food had spoiled and the ground surface was surprisingly boggy from the border so far and not ideal to pitch a tent on. After riding around the very busy town and being quite tired from a journey of more than 400 kilometers from Gonder in Ethiopia, including a reasonably stressful border crossing, we were not too bothered where we stayed so long as the bikes were safe and we could lie down. Eventually we stayed in a very cheap and very basic hotel, in a room without windows. It was not very nice at all and so we quickly unpacked, secured the bikes inside the lobby next to a guard, dumped our things and went for a walk around the town. The town was an unexpected and welcome surprise, teeming with activity, the markets and bazaars were still in full swing at 7 pm and it was full of restaurants and exotic food stalls. What was this about there being no food? We had truly left so called “Black Africa” and were now in the Middle East, with all its exotic smells, noises and sights. As for food, we were spoiled for choice and settled on Arabic style chicken, falafels and ful with bread and delicious fruit juices. 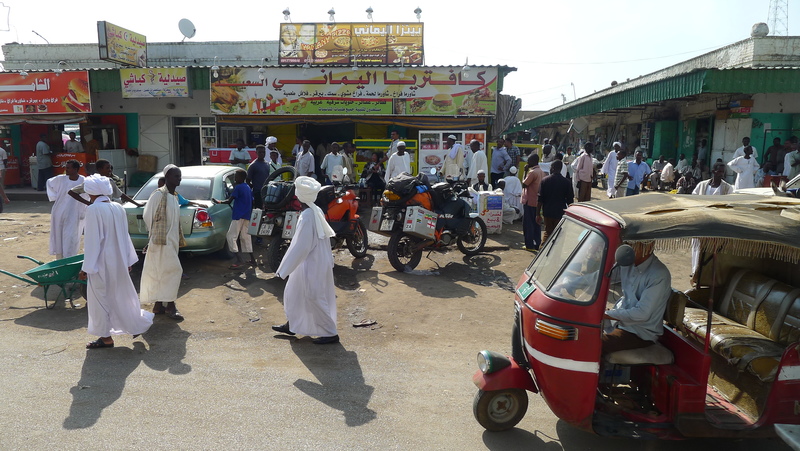 There may be no beer or alcohol in Sudan, but they know how to make great tea, coffee and fruit juices. There was also the aromatic smells of apples, cinnamon, cloves, raspberries and other flavours coming from Shishas which were bubbling and being puffed on in all the coffee houses and street corners. We sat outside in the hustle and bustle, with men in white robes (jallabiyahs) and turbans or embroidered hats who politely welcomed us and asked kindly about our trip and impressions of their country. So this was Sudan. 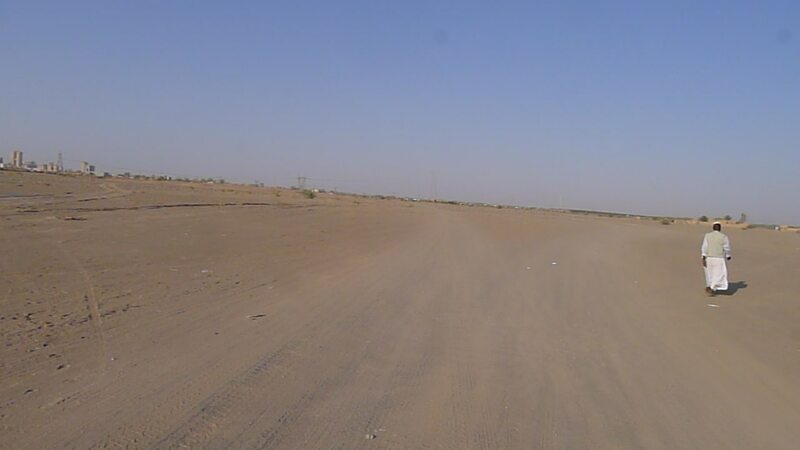 This stretch of road passes through sandy desert near Khartoum and is quite busy with trucks. The sides of road were strewn with tyre retreads that have come off. We are often asked why we are wearing thick riding gear in such heat… surprisingly its cooler than just being exposed to the hot air. 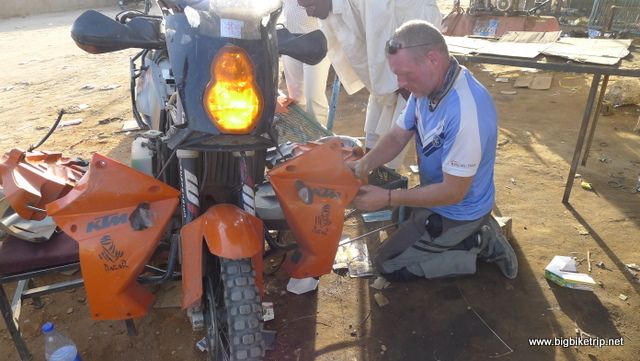 The next day we got petrol, filtered again through our “Steve Thomas” invention, with no hassles from the patient and friendly attendants despite the fact we faffed about and spilled fuel everywhere and then we headed off towards Khartoum. 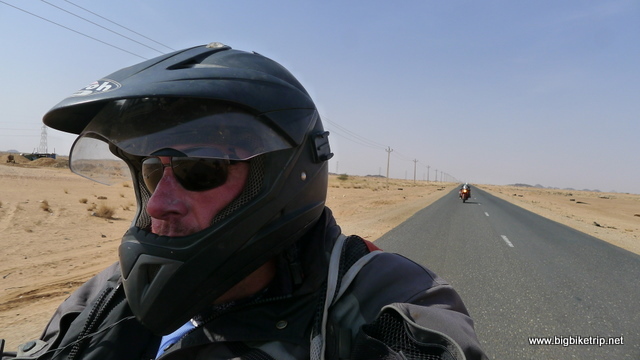 After a full days riding along decent roads with moderate traffic we arrived and Khartoum was not what I was expecting. Addis Ababa was a complete karzi, but Khartoum was more modern, interesting and organised. There were modern car show rooms on the outskirts of the city, much like in other developed cities, but interspersed with lots of mosques and minuets. The traffic lights worked, unlike in Addis Ababa, and nearly everyone was dressed in the white jallabiyah. I did not see many women, but those we saw were conservatively covered as required by Islamic custom. 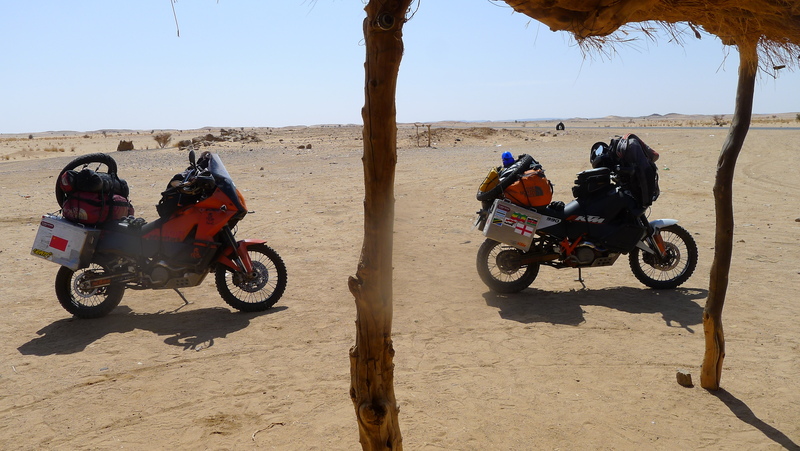 We were not sure where to stay, but we had earlier bumped into two German motorcyclists, Tobi and Kati riding southwards on the Ethiopian side of the border. They were riding smaller cc trials bikes and we swapped notes and they recommended we stay at the National Camp in Khartoum where the Sudanese athletes are trained. Not at the Blue Nile camp which was universally considered by all reviewers as ‘not very nice’… especially the lavatories. Whilst we were at the side of the road Tobi asked if by chance we had a spare rear inner tube and as it happened I did. 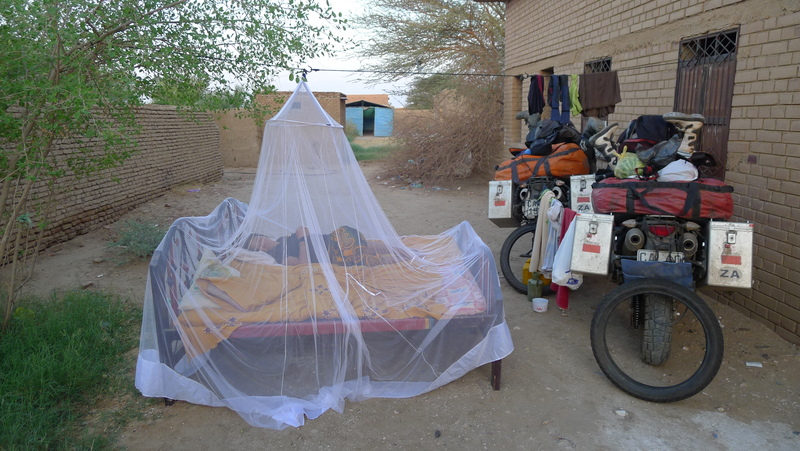 It was taking up room in my pannier, repaired and in good order from the puncture Fanny had in Tanzania. I handed it over to Tobi who seemed very relieved as he had been agonising about lack of inner tubes for the journey ahead … especially the tough roads in north Kenya. 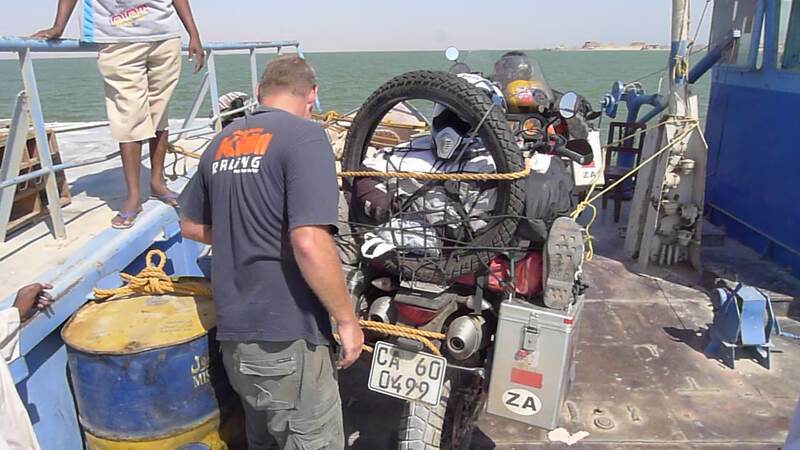 Its very comforting that the adventure biker community is such a close knit one and mutually looks after each other. 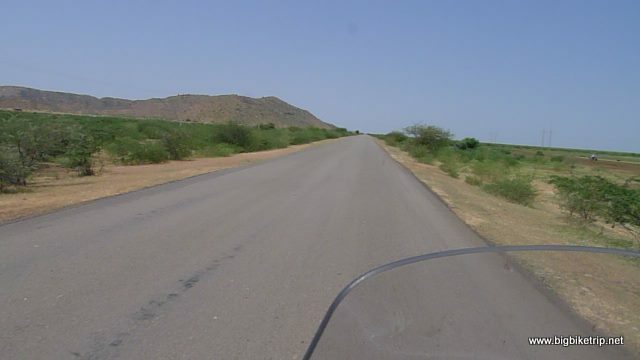 Anyway, now in the capital of Sudan we rode into the National Camp, the coordinates of which I had entered earlier into the GPS from a notice board at Wim’s Holland guest house in Addis Ababa, among other useful coordinates for Sudan. It was common for travelers to share the GPS coordinates of places to stay and useful locations such as garages, repair shops and fixers. The camp was a bit bleak, utilitarian and spartan, dominated by a huge mosque right in the middle, but a very welcome sight to Fanny and I. 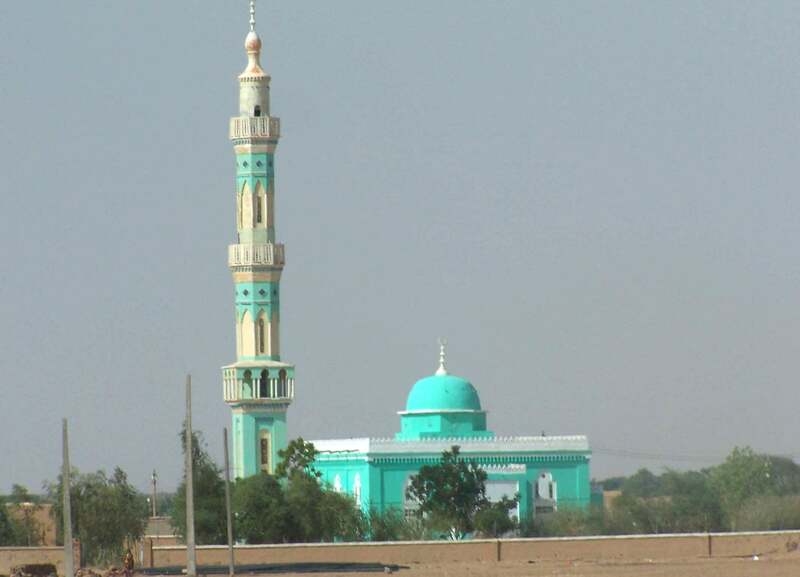 The whole of Khartoum was full of mosques from which calls to prayers would be blasted loudly and often. This sounded quite nice for about five minutes, but the wailing and chants continued almost constantly until we left two days later. I know salat required praying five times a day, but what I didn’t know was it started at 4 am and was unrelenting throughout the day. We were to notice many similarities between Arabs and people from China…such as a fondness for bickering, haggling over prices and making a lot of noise. However, I have personally found both these ancient cultures to also have in common strong traditions for producing superb food, very warm hospitality and an unbridled curiosity in what other people are doing, especially foreign visitors. My own culture no longer has any traditions or values, and if there were ever any in England they have been watered down into anomie. I suppose this is why I find international travel and especially living in places like China so fascinating. In Sudan everything is down to Insha Allah (God wills), but for me, God has neglected to include me in his distribution list about his will and to my secular mind the human earth bound prophets throughout history seem to be in complete disagreement. 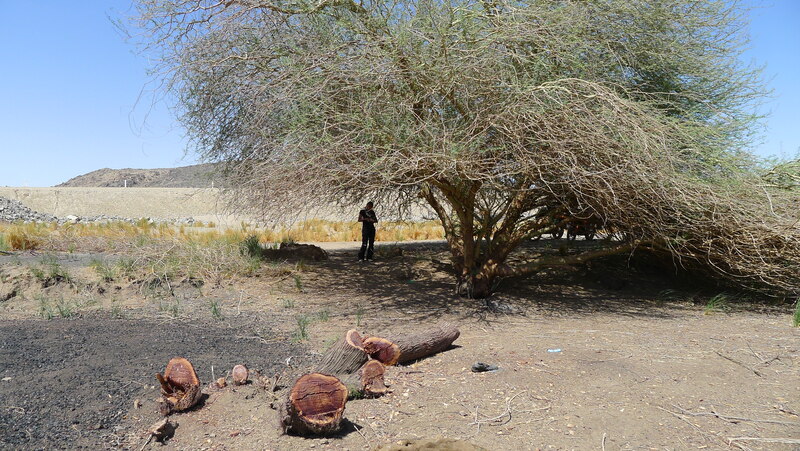 Later when we reached the Holy lands I would keep a lookout for the new iCommandments version 2.0 and any clear and unambiguous messages coming from any burning bushes, but sadly the only burning to be found in the Sinai desert or Jerusalem were my piles. How about a miracle to restore my Faith? Just a little one. A phone call from Max junior perhaps, or a logical and rationale conversation with his mother. Like high octane petrol in Africa, I seemed to be running a bit low on Faith. I don’t want anyone to think I’m an atheist like my commie riding partner, Fanny… or Stephen Fry or Christopher Hitchens or Stephen Hawkings. Why are atheists so smart and the faithful so intolerant and dimwitted? Who knows? God maybe? I think I believe in God and I also think I believe that England will win the FIFA World Cup again, that Pakistani cricketers aren’t all cheats and accountants are interesting people. Perhaps more accurately I am a member of the “undecided”, a non superstitious and rational group of people who just likes the peaceful ambiance, history and architectural splendor of ancient religious buildings and the beauty and wonder of the natural world. Or, perhaps, an agnostic, dyslexic insomniac….laying awake at night wondering if there really is a Dog. Ouch! Anyway, after we arrived at the camp gates and explained what we wanted and registered yet again we were shown to a very nice little grassy spot where we could pitch our tent, right under a minuet’s loud speakers which were adorned with colourful purple and pink fluorescent strip lights.. which were on all the time. Insha Allah. 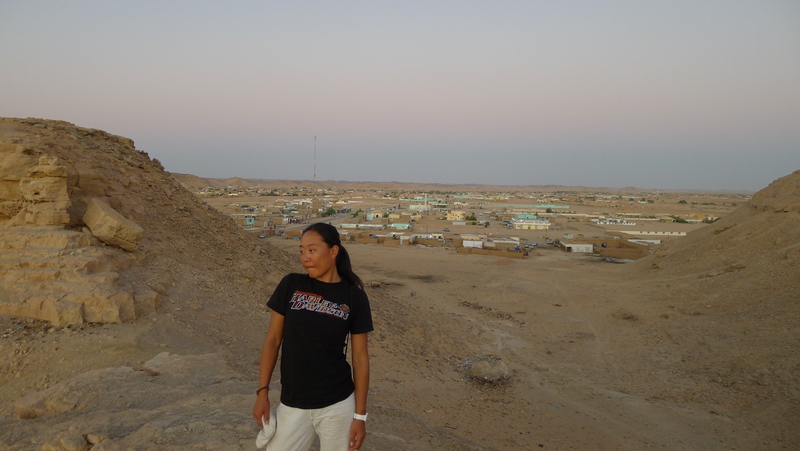 Fanny got out her MC Hammer modesty trousers again and we settled into camping along side Sudan’s national football team and the country’s other athletes. 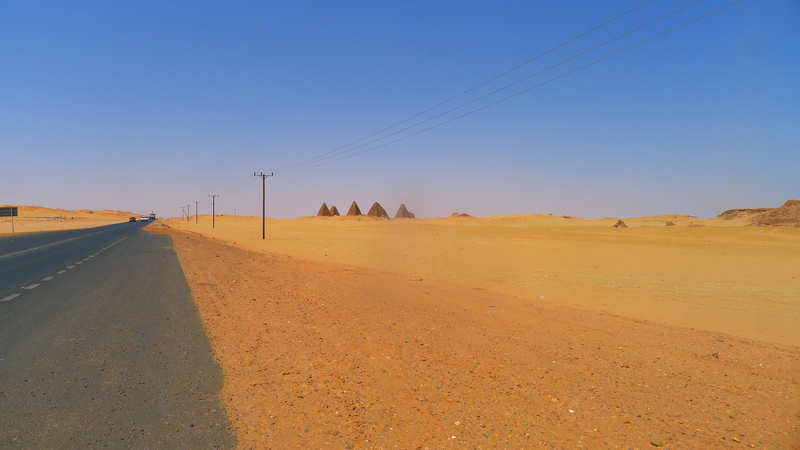 I rode off road on sandy tracks for a closer inspection of the pyramids. Not sure a police blue flashing light is absolutely essential on a motorcycle but it amused me and that’s the most important thing. Pyramids were good too. 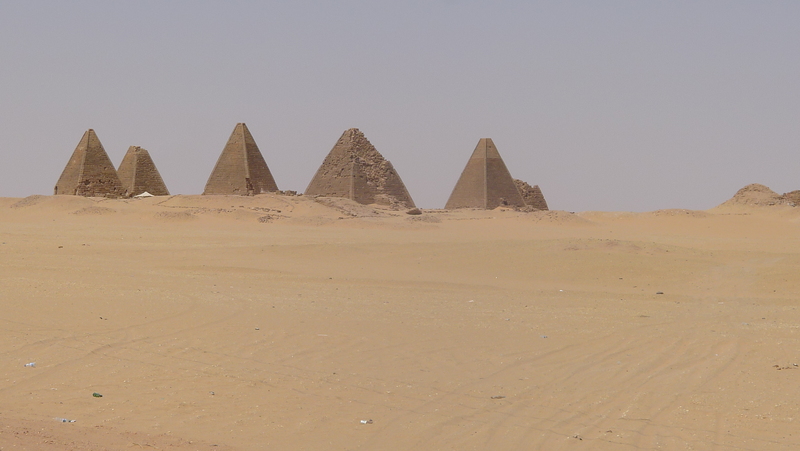 Umm… pyramids in Sudan. Would you adam and eve it? 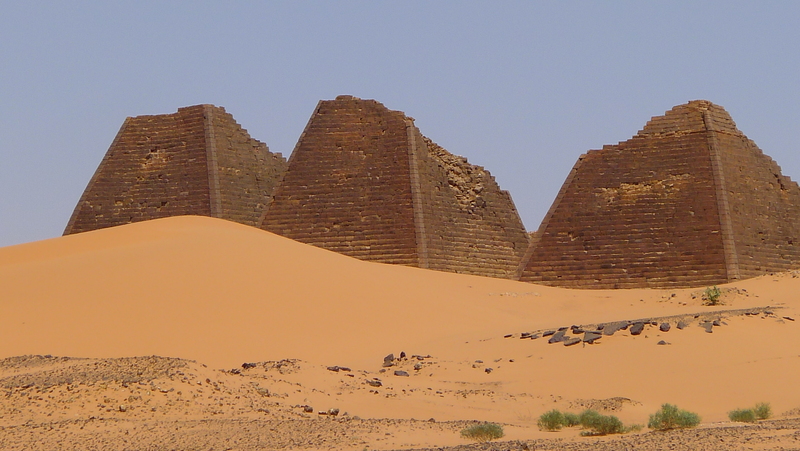 Bit of history ……The Nubian pyramids were built by the rulers of the Kushite (centered around Napata and Meroe). 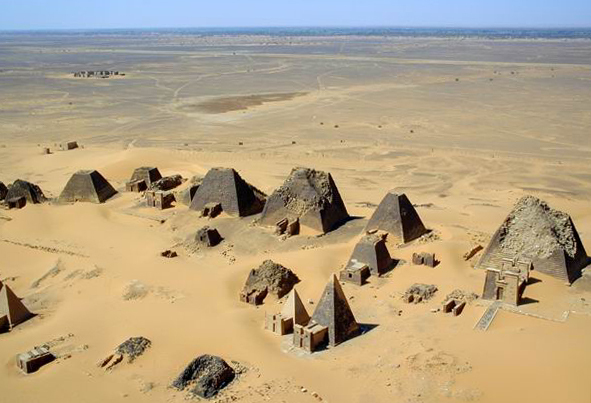 Prior to the Kushites building these pyramids in Sudan, there had been no pyramid construction in Egypt and the Nile Valley for more than 500 years. The area was home to three Kushite kingdoms during antiquity. The first had its capital at Kerma from (2600–1520 BC). The second was centered around Napata from (1000–300 BC). 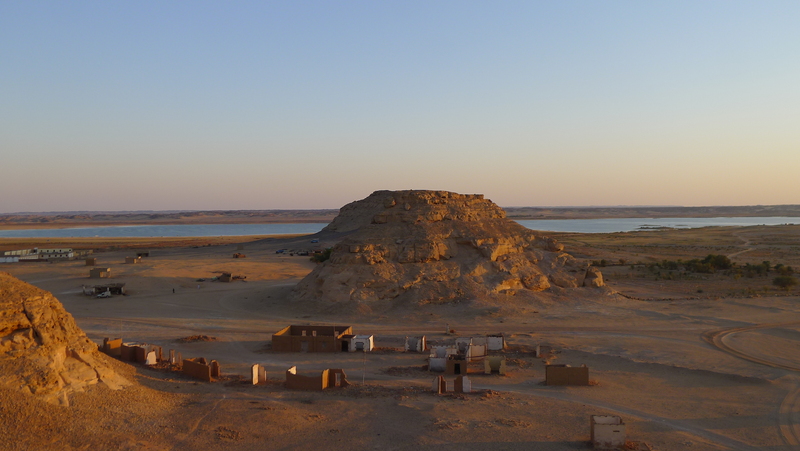 Finally, the last kingdom was centered around Meroë (300 BC–AD 300). Don’t think I could ever be a Muslim.. the hats don’t suit me. Would I like a ride on his camel.. umm… no. Would he like a ride on my KTM… umm.. no. Each to their own. Nice little camping spot by the Nile in northern Sudan. What’s this about crocodiles and snakes? No wonder George Bush the 2nd said it was the Axis of Evil. Not a KFC, McDonalds or plastic pyramids in a snow globe to be found anywhere. My goodness. 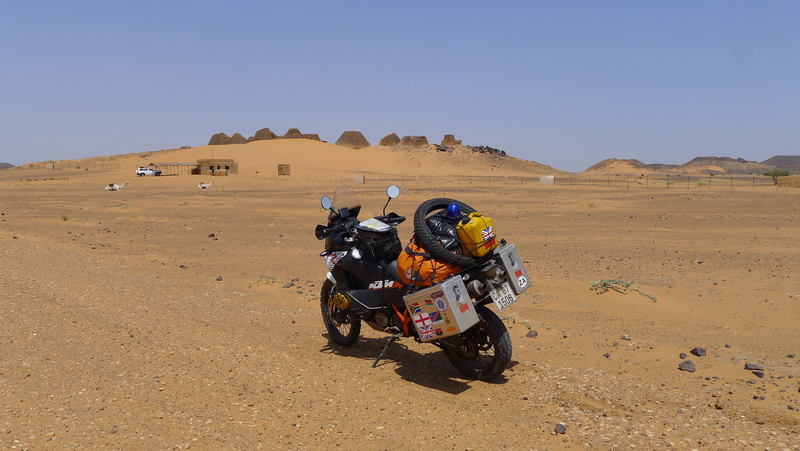 Me with my KTM 990 Adventure R at the Meroe Pyramids in Sudan. Happy days. indeed. Very soon after arriving at the National Camp we were discovered by Vladimir, a Ukrainian oil engineer who was marking time in Khartoum while his papers were being organised for his new posting to an oil refinery in South Sudan. Vladimir had been told that his papers “will be ready tomorrow”, for several months now, and rather than living in a tent like us, his company had splashed out on two adjoining air conditioned containers with satellite TV and other creature comforts while he waited. He quickly briefed us on the lay of the land, rules, what to do and not to do, and importantly where to get food. Everything was “No problem” with Vladimir and although I don’t think he was bored, because he seemed a busy, smart and energetic sort of guy, he was clearly very lonely and so when two foreigners rocked up through the gates he was very happy to have some company, even if they were English and Chinese. Vladimir had gone sort of native, could speak very good Arabic and had given up drink, but only through necessity. When I told him I still had two bottles of fake whiskey and vodka in our panniers he was very alarmed and warned me I could get 40 lashes for alcohol possession. I had actually forgotten that we still had these bottles and not given it much thought as I just assumed you couldn’t buy alcohol in Sudan…not that you would be beaten like a red headed stepson if you actually possessed it. Sounded like a plan to me and I gave commander like instructions for Fanny to get the contraband and bring it over. You can’t argue with that logic and a few minutes later Vladimir and I had our feet up on his table, “Johny Varder” whiskey for me and “Smearitoff” vodka for my new Ukrainian friend whilst we watched “Men in Black” and descended into a conversations of scribble and an evening of muted laughter, lest the alcohol police come round and take us off to chop chop square for a good whipping. Fanny wasn’t having any of it and decided to spend an evening with her new 19 year old Sudanese friend who ran the camp Internet office which was air-conditioned down to a positively chilly 22 degrees from the outside temperature of over 50. She left Vladimir to seriously fall off the wagon and for me to acquire a hangover that lasted for 48 hours. For some bizarre reason all foreigners had to register again with three days of entering Sudan. Actually its not a bizarre reason, its a blatant tactic to screw more money out of any person visiting the country. A double whammy of visa and processing fees. So, we got up early and in temperatures that were already high and rising quickly we set off through the streets of Khartoum to where Vladimir told us the government offices were located. It took us about an hour weaving through the unfamiliar city streets to find the offices, but even so we arrived bright and early at 7.30 a.m. so that we would be first in the queue. However on arrival we were told the offices did not open until 9.00 a.m and so we went for a wander and came back later to see the government officials still reading newspapers behind the glass of the cubicle compartments. The official, without looking up, pointed up at a clock on the wall which was indicating a few minutes still to go until exactly 9.00 a.m. 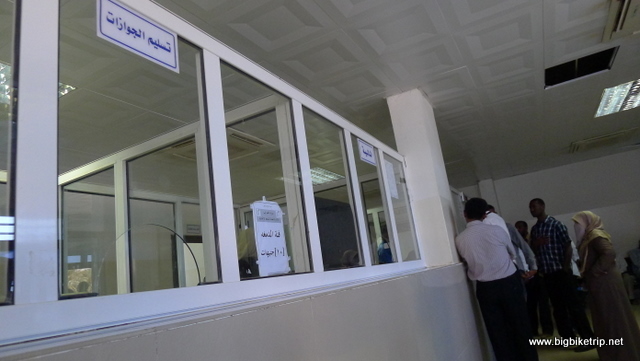 Registering in Khartoum … again. 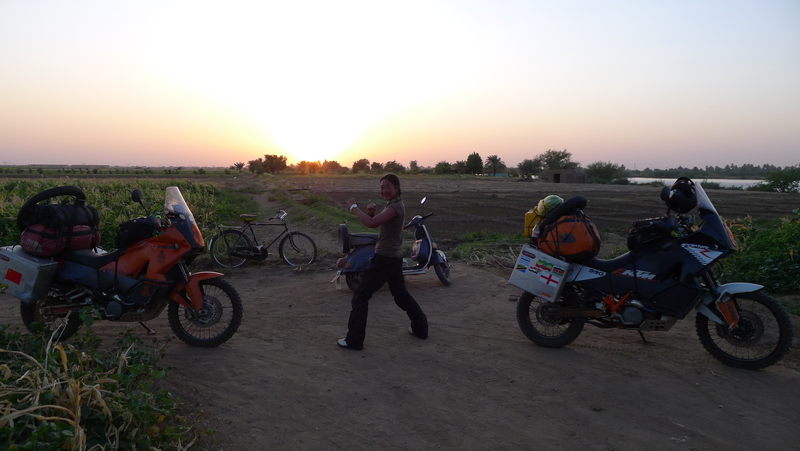 As we did to get around many cities in Africa and save fuel and hassle, we rode one bike and left the other at the camp site. Blue Nile where we had to go to in order to get an invitation to stay letter in order to complete registration. And so I stood exactly where I was watching the seconds tick by, and spot on nine asked the same question. The official made a sort of irritated huff and slowly folded up her newspaper and I thought she was going to say “the computer says nooo”, but instead she sent me off to photocopy every piece of documentation we had, and which we already had several photocopies of. ‘What’s wrong with this photocopy?’ I pleaded, waving a wad of paper at her. Without a word or even looking up she prodded her finger towards an old fellow who was sitting in a corner of the office with an ancient looking and well used photocopier…at a pound a sheet. Oh for goodness sake, but there was no choice. Things got no better and this tedious and completely unnecessary pen pushing and red tape went on for about an hour with the officials displaying every annoying trait learnt by public servants across the planet. Inevitably a document was required that we didn’t have and we were instructed to find an agent or go to a hotel that would issue us with an invitation letter. 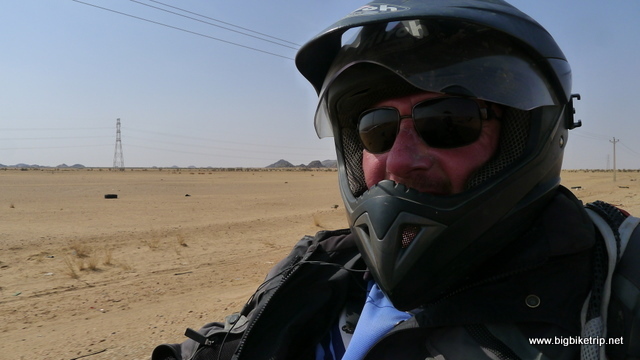 Couple of deep breaths, calm down and get on with it… no point arguing the toss … and so we left the government buildings and rode through Khartoum to the other side on the city in temperatures that were to reach over 50 degrees centigrade by mid morning. In fact, we had to go to the only other campsite we had heard of called Blue Nile and after eventually finding the manager, he scribbled some Arabic on a largely already completed proforma and handed it back to us in exchange for ten US dollars. By now it was ridiculously hot and the city was busy with traffic, mostly SUVs and 4x4s with their windows firmly closed and air-conditioners on full blast. Our GPS was not very accurate or up to date and so by accident we ended up exploring most of the city. By midday we got back to the immigration office, handed over the required documents and the fees and had our passports endorsed for the remainder of the two weeks stay. Why couldn’t all this have been taken care of at the border crossing? Why was it necessary anyway? Anyway, by then I was too relieved it was all over to be angry any more and so rode off back into the city and found a shady spot to park the bikes next to a local restaurant and had ful and salad for lunch – and breakfast. In the afternoon we decided to play the game, “Find the Egyptian Embassy” as I still did not have a visa to get into Egypt. Fanny had already got her visa, not just any old visa but a diplomatic one having charmed the Egyptian Consul General in Shanghai before she set off. 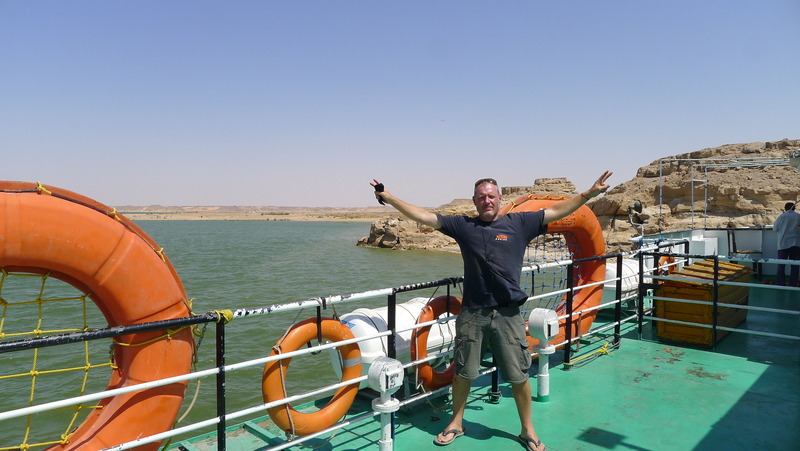 I heard it was possible to get a visa on the Wadi Halfa to Aswan ferry, but it made sense to try and get one in advance… just in case. Eventually we found the passport and visa section of the Egyptian Embassy about an hour or so later after nearly being arrested for riding our motorcycles too near to the presidential palace. 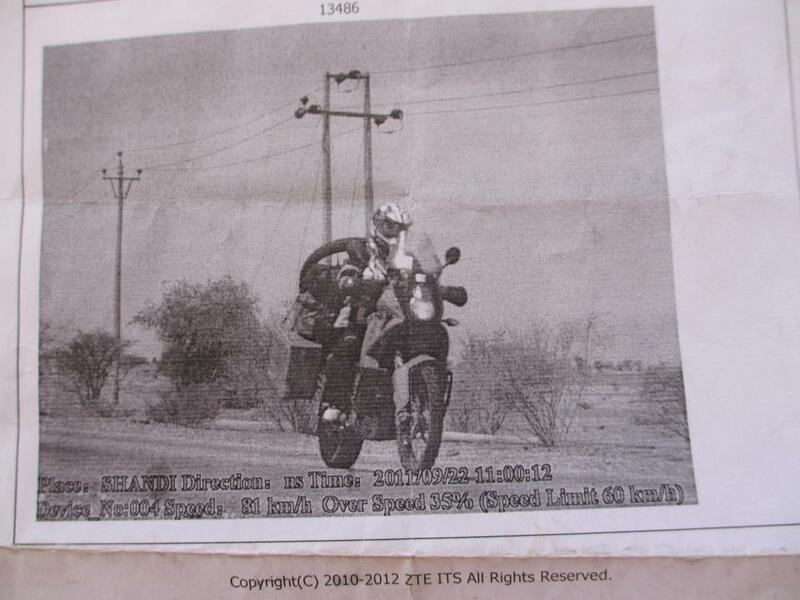 Apparently it is an offence that only a motorcyclist can commit .. no idea why. A tank or one of the many bakkie pick-ups with a mounted machine gun on the back I could understand, but a motorbike? . We parked the bikes, again in a shady spot to stop them melting and banged on the doors until someone came. Its closed we were told. And tomorrow and the day after and the day after that. Was there any way I could apply for a visa? No. ‘Right, I’ll get it at the border… I’m British don’t you know’. Then added for good measure and Fanny’s amusement ‘We used to own Egypt… how hard can it be?’. ‘No”. 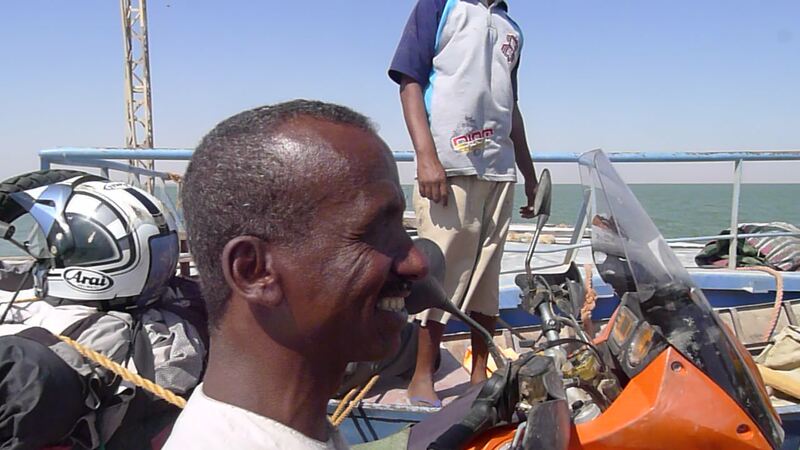 And with that I had had enough of dealing with Sudanese officialdom for one lifetime and we returned to the camp, despite the GPS trying to get us arrested again. The next day we packed up and left while it was still dark and just before calls to prayer. Khartoum wasn’t that bad and the camp-site was a pretty decent one and apart from the government officials people treated us very well, but time was running out and we had a long way to go. We filled our 30 litre water bag again with water that Vladimir had assured us, through his own scientific content analysis of the communal water tanks, was clean and actually contained trace elements of minerals good for our health. Excellent. Vladimir gave me a Sudanese woven white hat that made me look a bit daft, but I accepted it gratefully, wore it proudly and we said our farewells and vowed to visit the Ukraine one day. Yet another amazing character we met on our travels and a new friend. Our Internet research, our Michelin map of north east Africa and the GPS were not helping with our planning of the route ahead. Basically Sudan just looked like a huge yellow desert with a squiggly blue line through it that depicted the Nile. 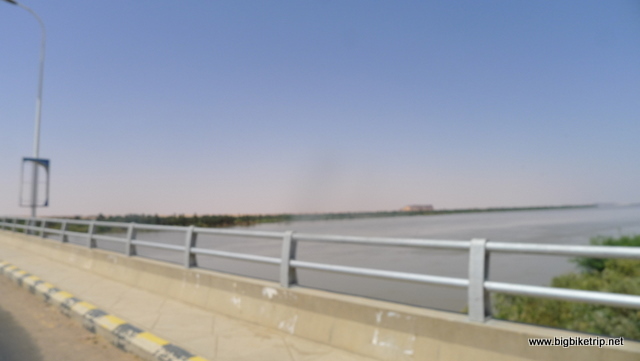 Khartoum is where the Blue Nile and White Nile merge and further north it is just the Nile–an incredible river that cuts through the nothingness of the desert all the way to the Mediterranean sea, the lush banks of which have spawned some of the worlds oldest and greatest civilizations. 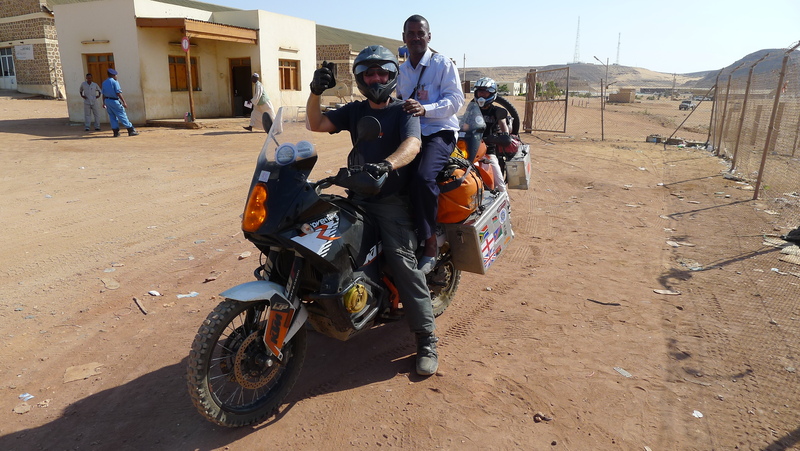 It is truly amazing to see and we count our ride through Sudan as one of the highlights of the entire trip. It also resulted in “Night Boat to Cairo” by Madness being played far too many times on my iPod and too much silly dancing. I had to explain to Fanny that the style of 2-tone ska dancing, which I was clearly not very good at, was very popular and cool in the late 70s and early 80s with bands like the Specials, The Selector and Madness. Fanny remained unconvinced and put these jilted movements down to my stiff ageing joints and general lack of rhythm. 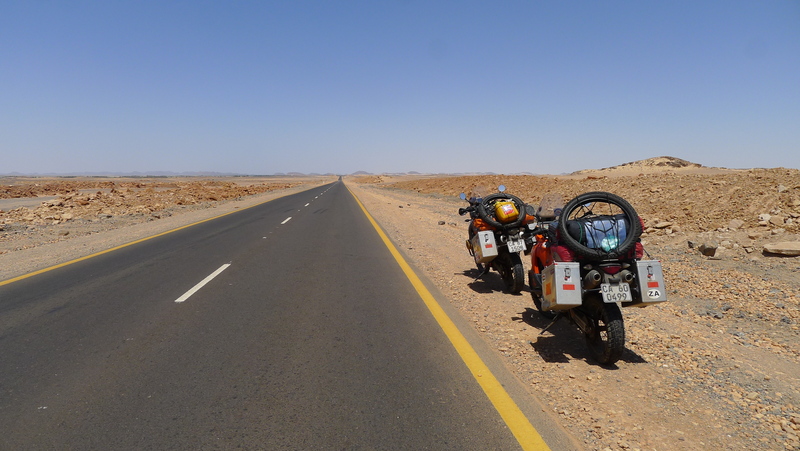 There is in fact a tarmac road that follows the Nile for several thousand kilometers in the direction we wanted to go, but allegedly there was also a road of unknown quality and surface that cuts across the Nubian desert. 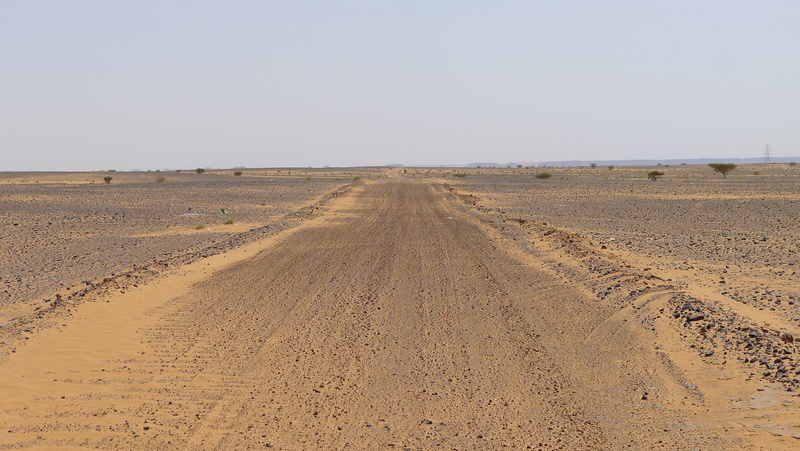 The existence of this road could not be verified by my GPS or any maps, but the local Nubian people were adamant that it existed and so we took a risk and decided to try and find it. 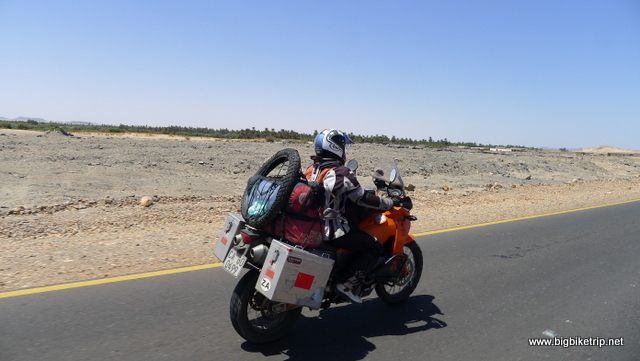 As we rode north through the town of Shendi on the road towards Port Sudan we could see the road littered with tyre re-treads that had come off the numerous overloaded trucks that used the busy route. My father, Peter used to be in the retreading industry, first with Pirelli and later with his own company. Looking at an endless verge of shed treads I thought we could have been millionaires if he had chosen to work in Sudan rather than Burton Upon Trent, and my mother wouldn’t have run off with the village blacksmith’s Neanderthal son, and, and. 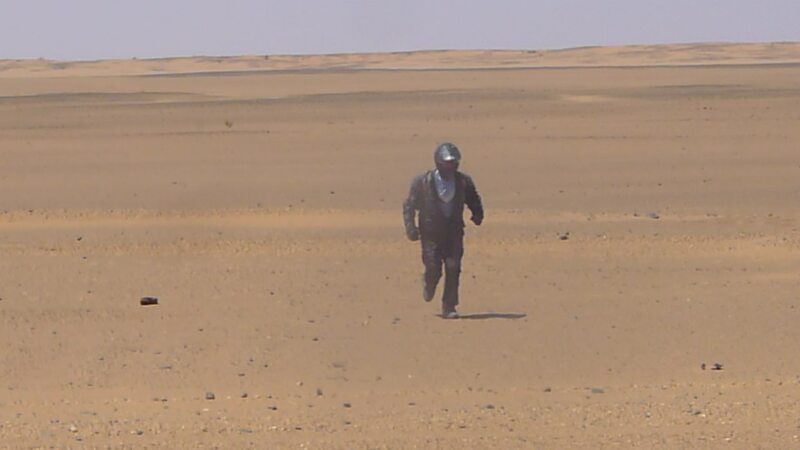 The things that run through your mind when riding through the desert. Amazing. 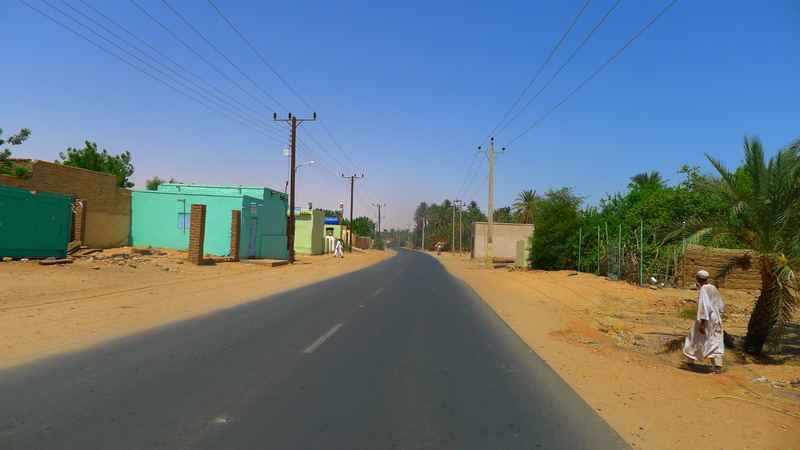 By stopping and getting directions from people in the street we found the new road and would follow it in a west north west direction through pristine white sand deserts. It was not marked on my GPS which just indicated we were “off road”, but it did exist and was very good quality and obviously very new. Often the fine sand drifted onto the road and the wind would blow it about and form patterns like flowing water. 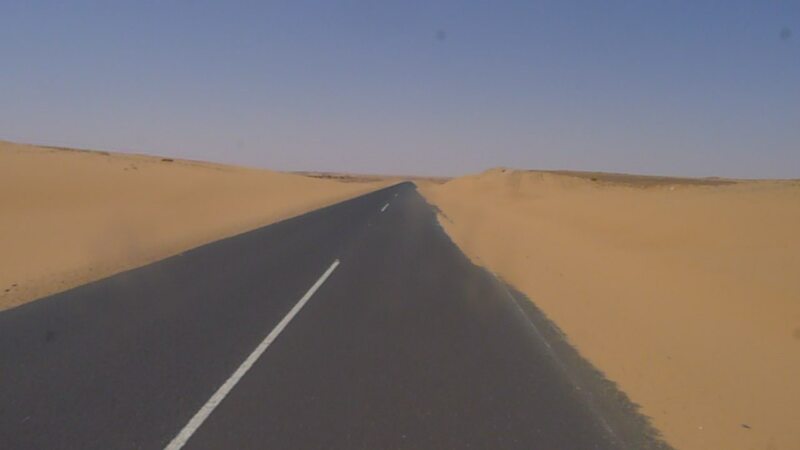 I am quite sure if the road was not used and maintained that it would completely disappear and become engulfed in the desert as the sand was constantly encroaching. A Souvenir from the Sudanese police. A speed camera in the middle of the desert. We never saw the speed cameras and no idea how they were camouflaged. In the end the police just gave us a warning and let us keep the pictures. 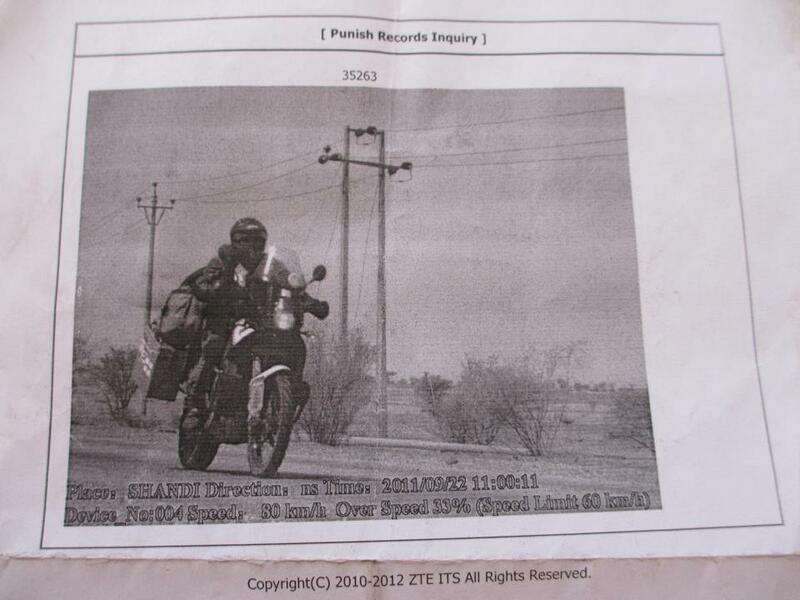 And one for me too… The police even had a printer in the middle of the desert to print out this “evidence”. 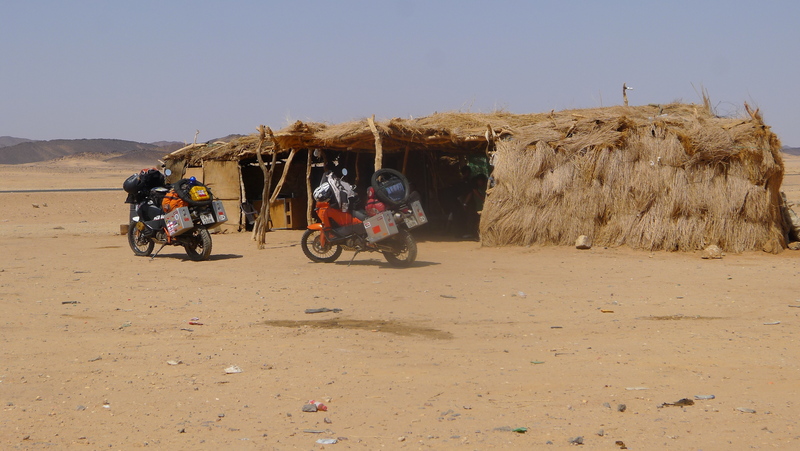 As it started getting late we were both keen on bush camping, but our attempts to find anywhere around Atbara were proving difficult. We actually looked around a very colonial part of town that had big British style family houses that were beginning to look quite sorry for themselves and all traces of Britishness had been Islamified, a bit like Bradford, and indeed the village of Utley where my ancestors come from in Yorkshire which now looks like a squalid suburb of Karachi on “bin day”. ‘Lets camp by the Nile’, I suggested to Fanny, and she was quite keen and so we zigzagged through town and back streets to the banks of the huge river and found a grassy spot which we could camp on and make a fire. It looked really nice, but we were soon discovered by the sort of menacing teenagers found throughout the world that you don’t want to meet. They were very much like the hyenas in the movie “The Lion King”, a couple of cocky ones and a very dumb one. It was obvious to me that they were “scoping” us out to steal or rob from later, perhaps during the night. The “Idiot Boy” kept giggling to himself, and he visibly dribbled when he caught sight of our cameras and other possessions as I opened my tank bag. They continued to hang around and annoy us with feigned and insincere friendliness. Its the same anywhere in the world… you have to be suspicious of teenagers who actually want to spend time with adults. There is always an ulterior and inevitably selfish reason. I was slowly losing my patience with them and so I discussed with Fanny in Chinese what we should do. She wanted to stay, but I knew very well these local oafs were nothing but trouble, and now they had found a target in their own back yard. It would not end well for one of us, probably not for them as I had a bag full of offensive weapons and Fanny is perfectly able to take care of herself… she is a boxing champion after all. Had I misjudged the situation? Nope, I didn’t think so. My sixth sense that always seems to serve me well had kicked in and I recognised it for what is was. A bad place to be and a very bad place to set up camp. I have a passionate hatred of feral thieving yobs that started from my police days in London when I saw the viciousness and harm they could cause their innocent victims, often preying on the elderly and most vulnerable. I decided to err on the side of caution and so we rode off to find another safer spot where we could relax and sleep in peace. A nice camp site by the River Nile, until we were discovered by the local yobs. We would have to find a more remote spot. Fanny wastes no time settling in.. Thank you very much to Ahmed and his family. 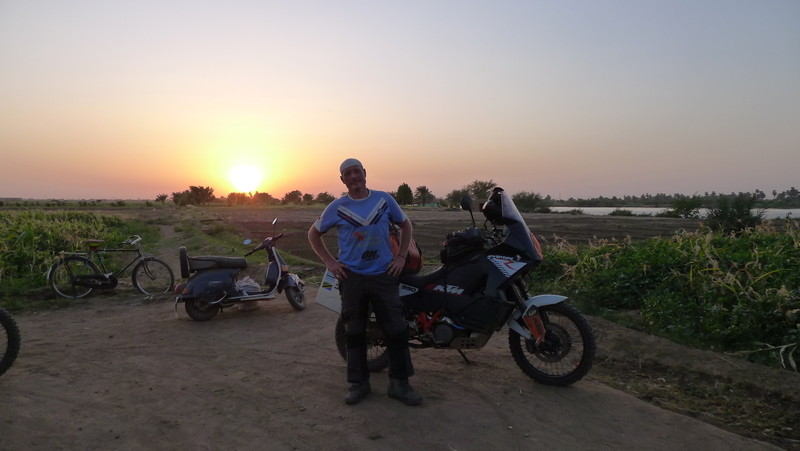 We had noted that the opposite bank of the Nile looked more remote and so we went back into town, rode across the main bridge, down into the papyrus fields and weaved our way across agricultural paddy fields to a sunny spot by the banks of the river. We thought we were alone but soon realized there were some people inside a thatched hut next to the river. It turned out that inside were some very laid back middle aged guys who were smoking hashish and appeared to be very relaxed and chilled. We broached the idea of camping with them. ‘No worries’, came the answer, ‘you like some?’ one added offering us a huge spliff. ‘No thanks’, I replied, ‘I never smoke and ride’. 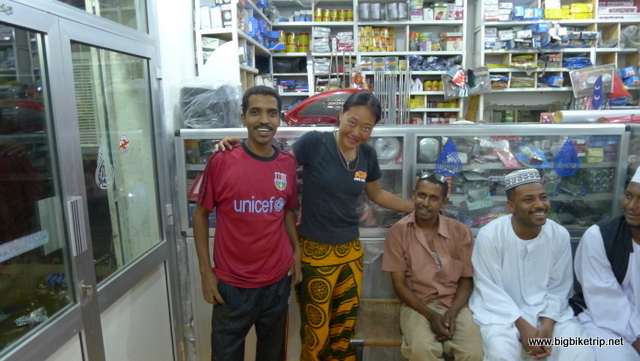 ‘No worries’, ‘be happy’ and they gave Fanny a regular Sudanese tobacco cigarette which she gladly accepted, as indeed a recipient of the Shanghai Sports Personality of the Year Award should. We did a quick recce of the river bank and worked out the optimal position to pitch our tent that looked dry, smooth and flat and yet sufficiently safe from a nocturnal visit by crocodiles, snakes or scorpions, all of which we were assured were plentiful at this particular location, although I couldn’t see any sign at all and was slightly doubtful that any would cause us any trouble anyway. While we were looking around another man came up and introduced himself as Ahmed and the owner of the land– all of it. I apologised for trespassing and asked if it was OK for us to camp on his land. ‘No problem’, came the answer, but after a pause he said ‘but here not good place’ and then said some Arabic words which we did not understand but through sign language we found out meant snakes and scorpions–and apparently a lot of them. What about Crocodiles? – Yes some of those too. After some thought, that included wondering about Sudanese snakes and Nile crocodiles, and getting over the initial embarrassment of too much unfamiliar generosity, we agreed to go back to his house. He ambled along paths and across small ridges and bridges spanning the irrigated farmland and we followed him slowly on our bikes. 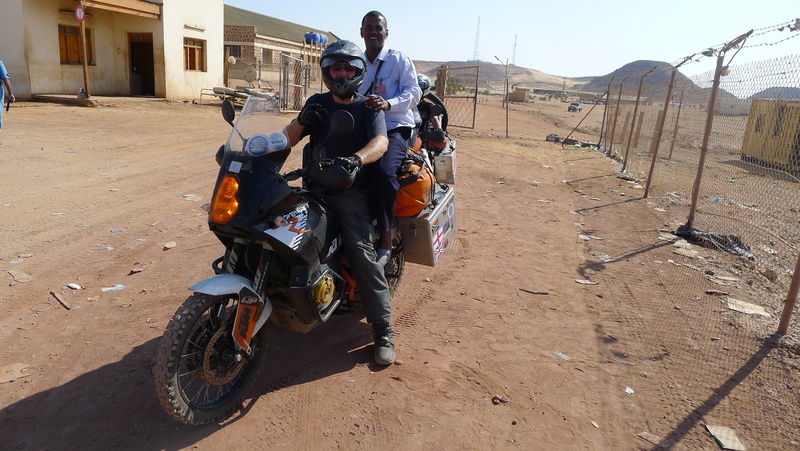 As we approached the nearby walled village, still crawling along and wading our bikes as slowly as he was walking Ahmed gave a running commentary and introduced every house we passed– it seemed every single one of them belonged to some kind of relative or family member. Eventually we arrived at a gated complex, not too dissimilar in looks to the infamous compound Osama Bin Laden was captured in in Pakistan a few months later and after riding through some impressive wooden gates, we parked up our bikes in his courtyard. Ahmed then went off and I was really hoping he wasn’t going to reappear with some mates armed with various sharp bladed instruments and a video camera. When he did come back he was dragging some steel framed beds and I will admit the first thought that went through my mind was that we would be tied down onto them and become the latest stars in some macabre YouTube video, but all Ahmed was doing was setting them up in the courtyard outside his house with mattresses, sheets and pillows so we would be comfortable for the night. I looked at Fanny and she was positively brimming with excitement at this latest development in our adventure. Ah the Chinese… bless them … no imagination whatsoever. I, on the other hand, with far too much imagination, was already in the advance stages of an escape and evasion plan. 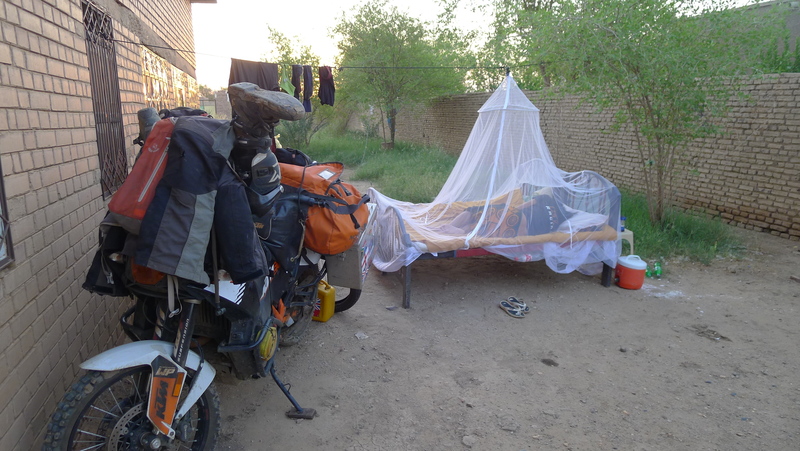 Once the beds were set up we hung our huge mosquito net above them using our pannier bungee cords attached to nearby trees, unpacked the minimum amount of overnight kit, prepared the bikes for the next day and washed ourselves. Finally I started to relax and we both looked around in amusement at the strange situation we found ourselves in. Later, just as the sun set we were treated to a meal that consisted of everything that Ahmed and his wife had in their pantry, a truly eclectic mix of food items that included jam, tinned pineapples, some kind of sweet coconut and milk mixture, tinned sardines and processed cheese triangle, just like the ones I used to eat as a kid. Clearly they were not expecting guests. 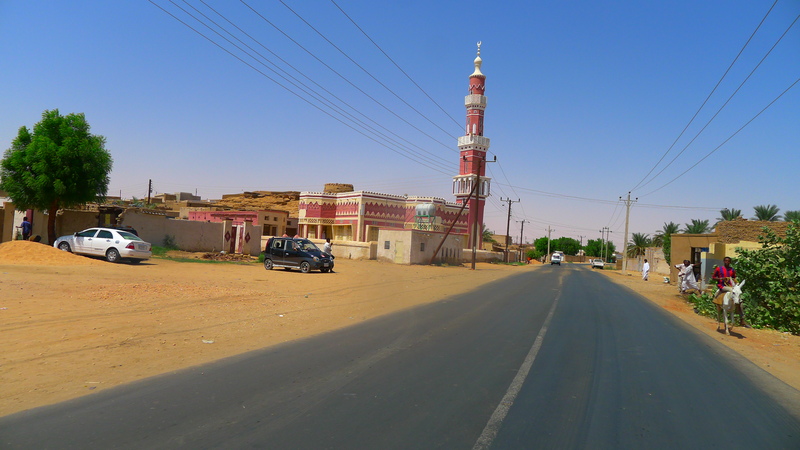 Ahmed was apologetic that the meal was not good enough and pleaded with us to stay a few days so that he could show us around Atbara and prepare a lavish banquet of roasted goat, Nile fish and other Sudanese specialties. It was very tempting, but the visa problem remained. 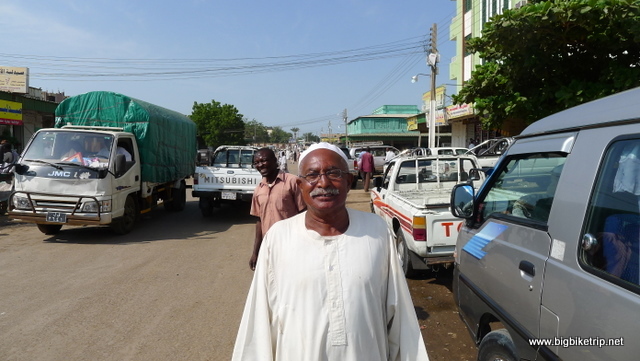 Ahmed explained that one of his eleven brothers was a high ranking general in Khartoum and everything was ‘No Problem’. ‘Visa– no problem’, ‘Stay, please’, ‘Everything no problem’. With a good deal of regret we had to turn his generous offer to stay longer down. I am never entirely sure of the polite and correct protocols and etiquette when being offered such kindness, but with an internal time clock that was nagging me to press on and having discussed with Fanny we decided to get going. One thing is for sure, my previous impressions of Sudan, its people and it culture was changing rapidly and very much for the better. As it turned out Ahmed was very well connected. The house next to the courtyard we were sleeping in was still being renovated and Ahmed gave us a guided tour of the many rooms inside. He very proudly described the decoration in progress, right down to gold leaf covered ceilings and bejeweled curtains. It was obviously going to be a palatial home and we said we would love to visit again in the future. Ahmed was insistent that we should return and stay with him and his family. He was also, so it seemed, very taken with Fanny, clearly a candidate for wife #4. 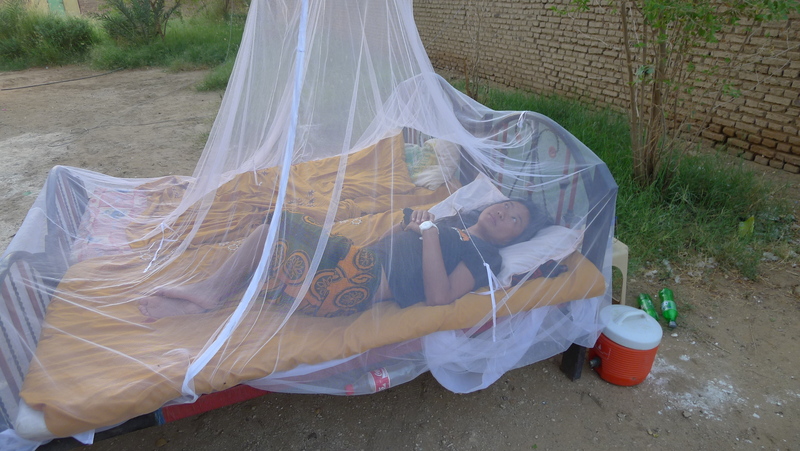 We had an amazing and restful sleep under the stars, protected from any insects by the mosquito net and wafted with gentle breezes from the Nile and surrounding deserts. Could not be better and we slept soundly, occasionally waking to wonder where we were and take in the star studded sky. We were greeted in the morning to amazing coffee and breakfast. 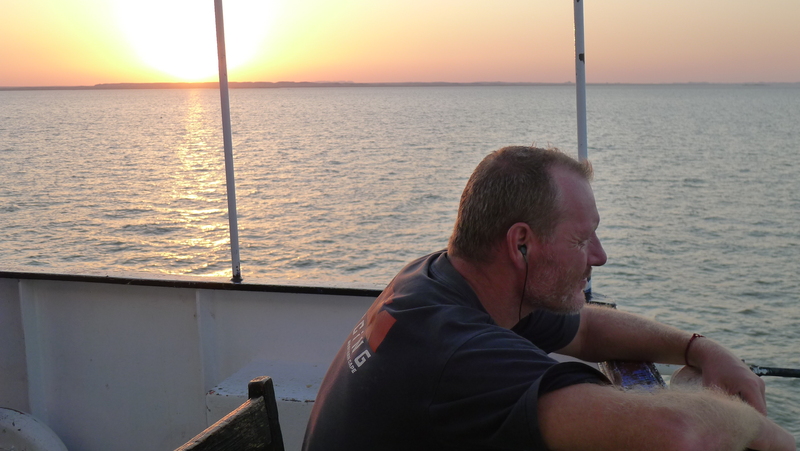 We swapped contact details, met some of Ahmed’s children, one of his wives and many of his extended family, learnt more about Islam and Sudanese life and again, as was all too often on the trip, we had to bide our farewells to a new friend all too soon. They were absolutely fantastic people and we were truly humbled by their kindness and hospitality. ‘Karaoke’, she said with a laugh. Yeah, right! 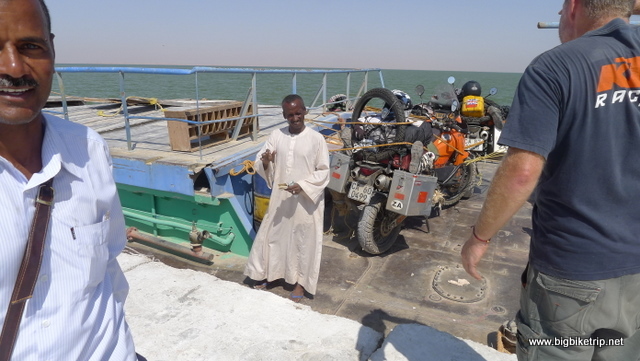 We then packed up and left a crowd of cheering and waving friends and relatives of Ahmed, crossed the Nile again just outside Atbara and we would not cross it again until we reached Merowe, 400 kilometers away on the other side of the Nubian desert. 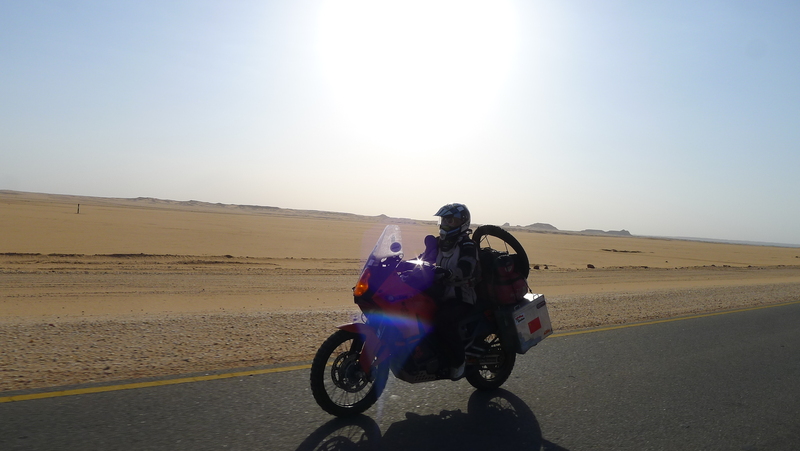 As we rode at a steady 100 kph we entered a world very few people will ever see. 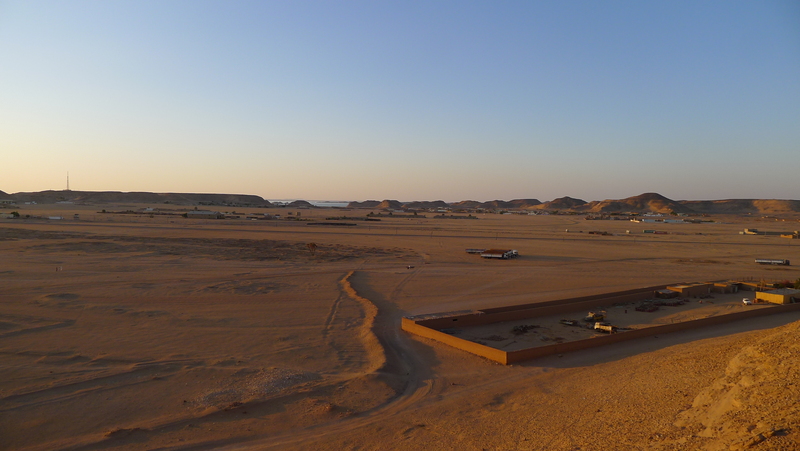 Pristine white sand desert, sand dunes, rose coloured rocky mountains, Bedouin camps and the occasional camel. 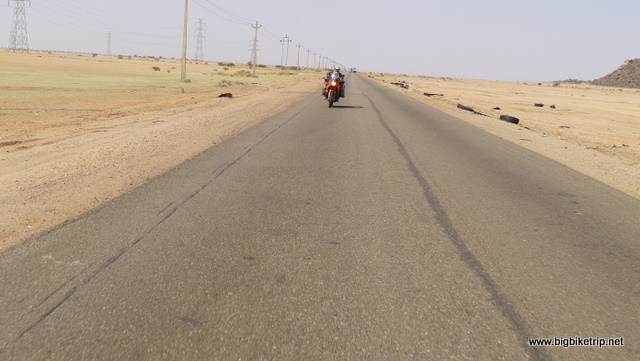 There was very little traffic and none of the tyre retreads littering the side of the road that we had seen on the highways around Khartoum and on the relatively busy route to Port Sudan. Our GPS database was completely unaware of this road, as it must have been quite new. It appeared, as indeed it was, that we were in the middle of nowhere. It was all that adventure riding was meant to be. I absolutely loved this bit of our trip. 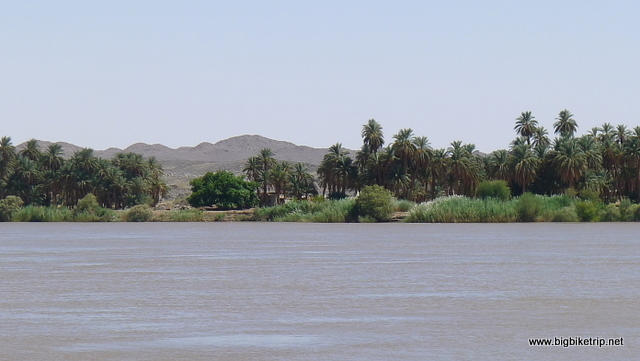 The route from Atbara cut through the desert to the ancient pyramids at Jebel Barkal and across the desert again to Dongola where we would pick up the Nile again and follow it north to Wadi Halfa near the border with Egypt. 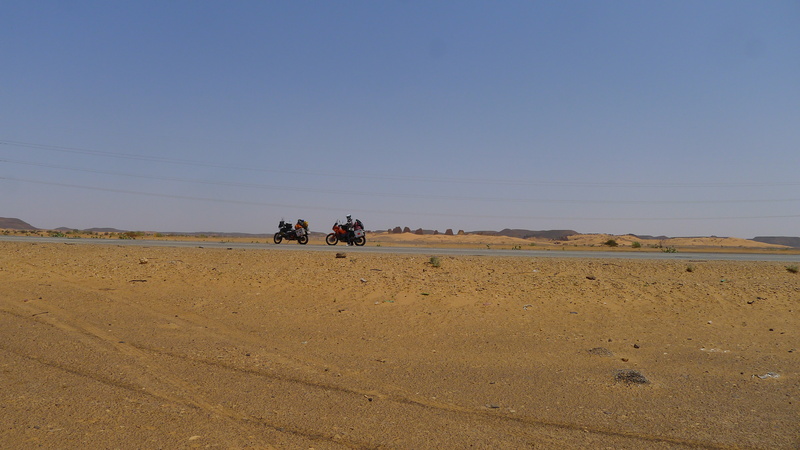 Riding through the outskirts of Atbara along a long sandy road… and then up onto a tar road and across the Nile and desert again towards Jebel Barkal. 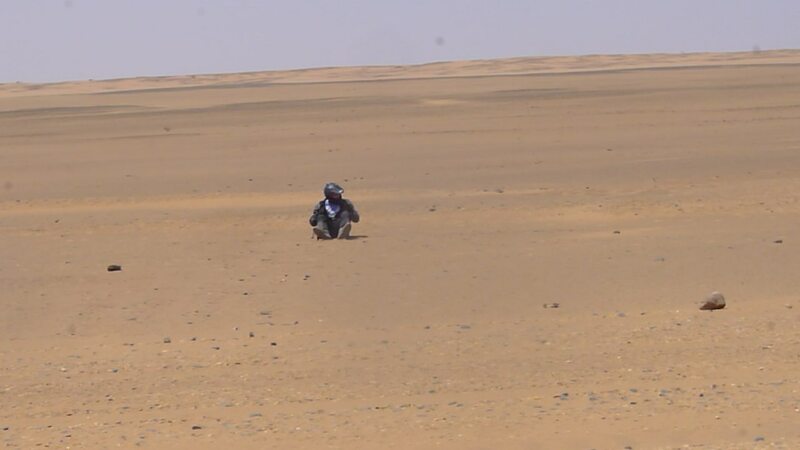 Fanny cruising through the Nubian desert under the hot sun. I barely get off my bike to have a pee, Fanny being a woman mades a bit more effort. Watch out for those vipers and scorpions! Our new friends… they gave us coffee and we shared a water melon with them at what must be the most remote and interesting coffee shop I have ever been to. What fun. Sometimes you just have to stop and take in the surroundings. And do some push ups and sit ups. Why? Because I can. As we got nearer to the Nile life started to reappear. Its amazing to think that this part of the world has pretty much remained unchanged for millennia. 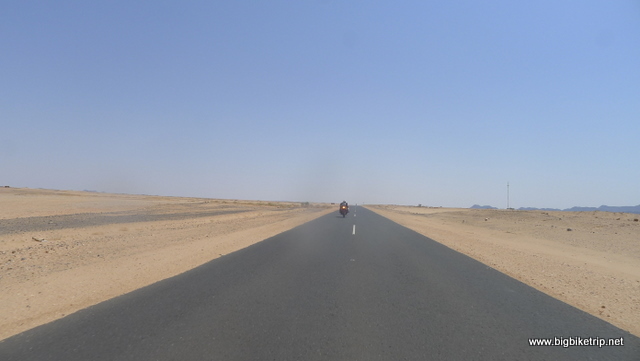 Riding past Jebel Barkal… extremely hot and Fanny’s starter relay on her bike is having problems. We really don”t want to break down here and of course, we do. 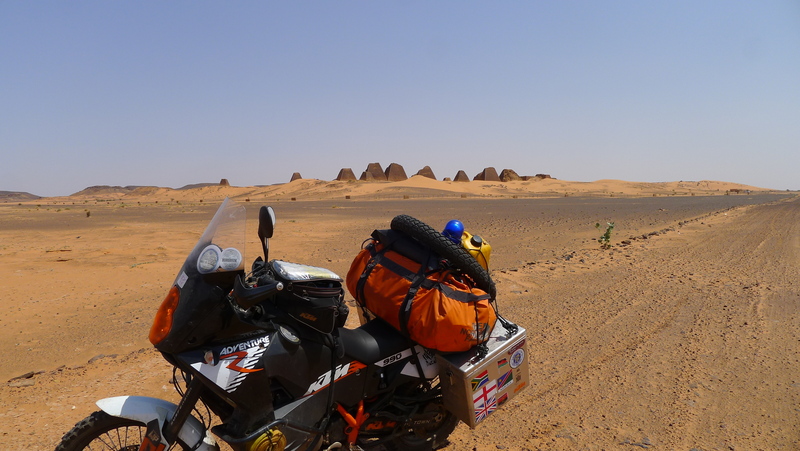 One of the few times we had a problem with our KTMs on the whole expedition. 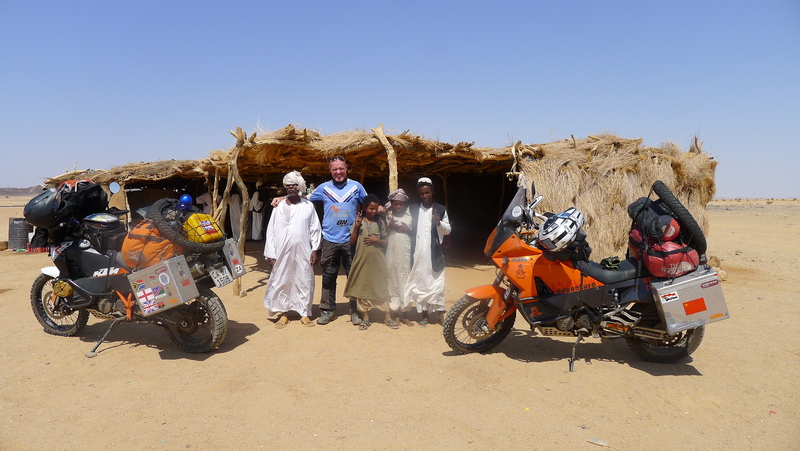 After about 150 kilometers we stopped for a rest and a water break at a straw hut in the middle of the Nubian desert and found out they had coffee. So this must be Strawbucks. 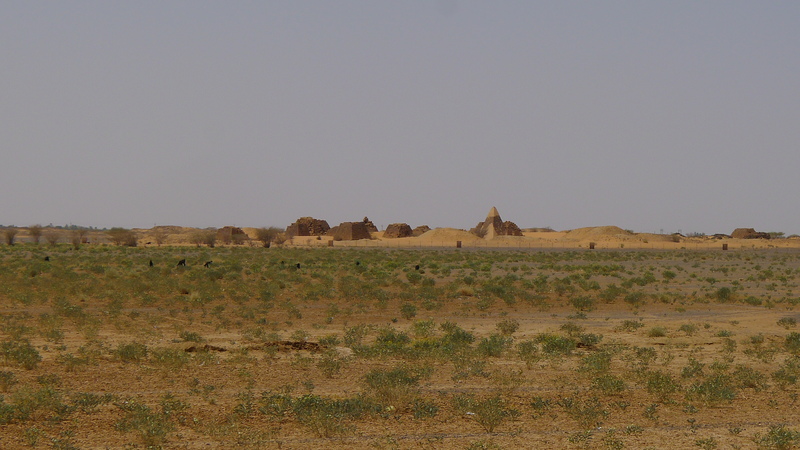 The people who lived here in the middle of nowhere recognised themselves as Nubian rather than Sudanese or Egyptian. We drank very good coffees under the shade of a canopy, were encouraged to take some water from large earthenware pots using a long ladle and played with the children. 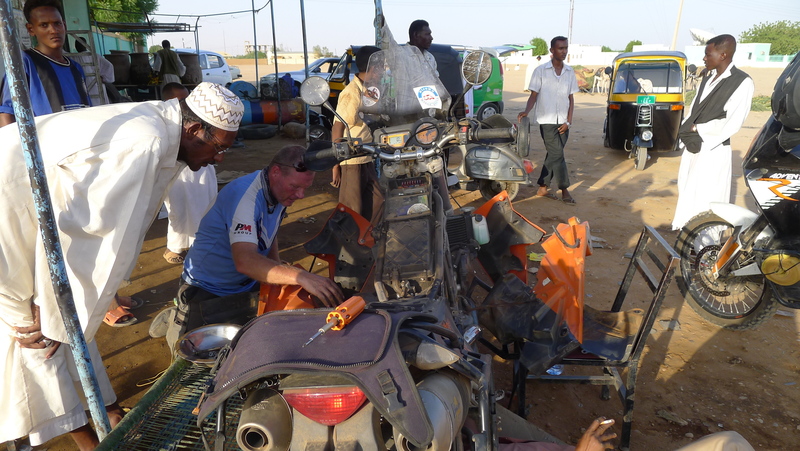 We had been balancing a huge water melon on the back of Fanny’s bike and here seemed a good place to cut it open and share with our Nubian friends. In the sun the temperature was in the late forties, but in the shade of the straw hut much cooler. And so we sat eating cool water melon, drinking coffee and enjoyed the incredible friendliness and hospitality offered by people with no real material possessions. In reality they had more than most people… they seemed happy and content. Later on after another stretch of riding for an hour or so we stopped for another water break. 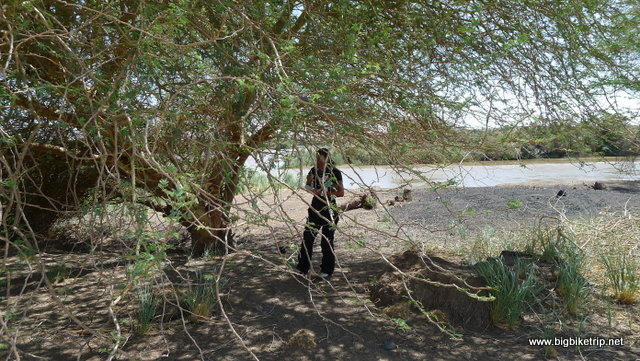 We each had to drink about 8-10 liters of water a day in Sudan as it was so hot and dry. 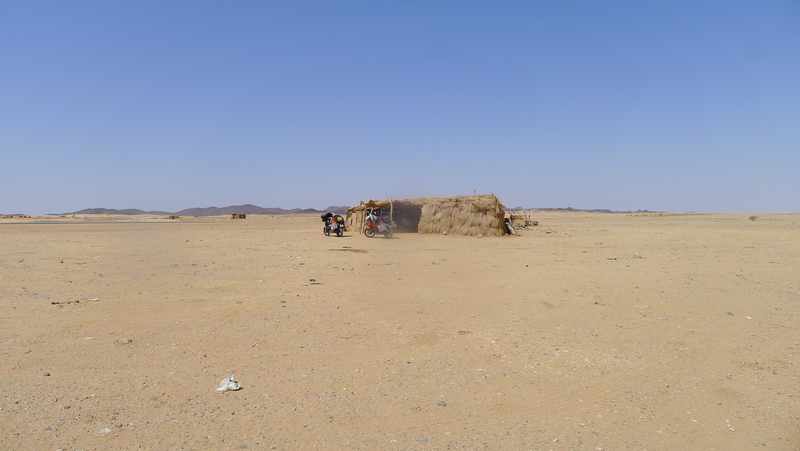 We were again in the middle of a dry sandy desert and when we attempted to get going again Fanny’s bike wouldn’t start. Its not a good feeling to break down in such a place, but I had a tow rope and there was a small town next to the Jebel Markal temples and pyramids we could get to. I did try to bump start her bike, but with a 1000 cc V-twin engine it is nigh on impossible, especially on hot sandy roads. I then did some banging on the starter motor and fortunately the engine got going again. 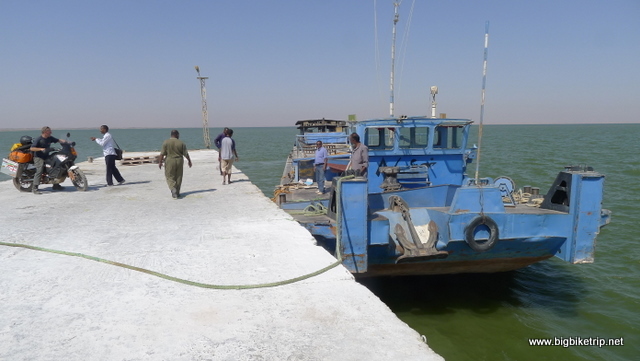 I was, however, a bit concerned about what the problem actually was and whether we could get it fixed and get to Wadi Halfa in time for the once a week ferry, and before our visas run out. We cruised into town and Fanny stopped the bike and it refused to start again and so I had to push it until we found some people who pointed us to a very small garage and workshop which seemed to be mainly repairing tut tuts, the three wheeled taxi things found across the world from Thailand, India to Egypt. We were soon surrounded by a huge crowd as I started my attempt to explain what had happened and what I thought was wrong with Fanny’s bike. I was very concerned that their general enthusiasm to help might disguise general incompetency to understand the complexities of a modern KTM motorcycle, as most bikes they would have come across were the generic and ubiquitous Chinese 150cc ones covered in chrome, with little more sophistication than motorcycles from 50-70 years ago. Anyway, beggars can’t be choosers and a mechanic started poking about with his lighted fag hanging from his lips and dangerously close to the fuel tanks, with of course much debate and heated discussion from all the people around. He spoke no English whatsoever and somehow or another we managed to communicate and we eventually became quite good at rather technical discussions. 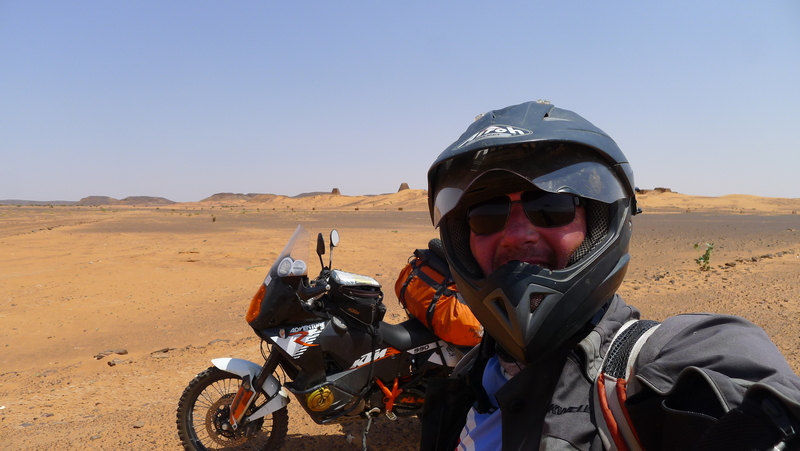 The KTM 990 Adventure is not the easiest bike with which to get to the guts of the LC8 engine and electronics and requires removing fuel tanks, panels and importantly remembering where all the bits originally came from and were attached to. From my EOD days I learnt tidy, systematic procedures and discipline which are often employed by western mechanics, but in Africa they do it their own way, and this always stressed me out as bolts and wires were strewn about in the sand, being collected by me and placed in logical sequence in a container, only to be knocked over by one of the many onlooker’s flip flops and strewn about in the sand and debris again. A very nice brass, and much used, multimeter tested all the circuits and eventually we came to the conclusion, as I correctly guessed, that the starter relay had a problem. If it was hit with a spanner it worked, but eventually this technique stopped working despite ever larger spanners and heavier tools being used to bang it. Short circuiting the electrical connectors at the top of the relay did start the bike, but to a dangerous firework display of sparks and when it was put back together this would be too dangerous and inconvenient to do, and so a generic Chinese starter relay was sourced from somewhere or another. I inspected it closely as it beared little resemblance to the KTM one, certainly it had less wires sticking out of it and no safety fuse along the main circuit. I am quite sure KTM put a fuse along the main circuit for some reason. We tried fitting the relay in parallel to the existing relay and it worked but it would no longer fit inside the Touratech belly pan protector, and the mechanic’s suggestions to use gaffer tape to secure it to the side did not appeal to me…whatsoever. I think I am on my knees praying rather than fixing anything. 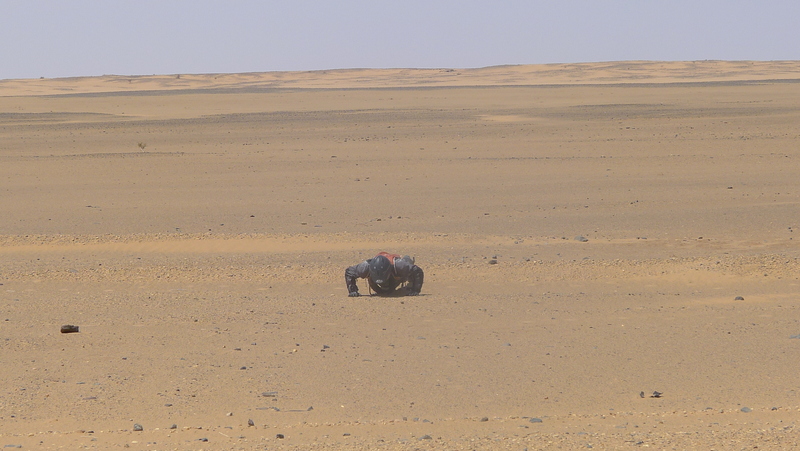 Easy to lose a bolt or nut in the desert sand so I insisted that everything was laid out in an orderly matter… but not easy with dozens of people swarming about try to help and give advise. Fanny supervising me doing the bike fixing in fifty degrees heat. The only solution was to replace the KTM relay with the Chinese one and use a circuit junction box that I had packed with the spares in my panniers. I insisted on using this rather than joining the wires with tape as suggested by one of the local mechanics. I also made sure that a 30 Amp fuse was wired into the circuit, scribbled the wiring circuit onto the inside of an opened cigarette packet, tested the circuits with the multi-meter and then started the bike several times to make sure everything was OK. The only problem now was to make sure the Chinese relay, which was cylindrical in shape, could fit in the rubber casing that the KTM relay fits into (a rectangle) and Bobs your uncle. With some rearrangements, filing off some corners and securing firmly in place with a few other cigarette packets, wire and tape it worked. 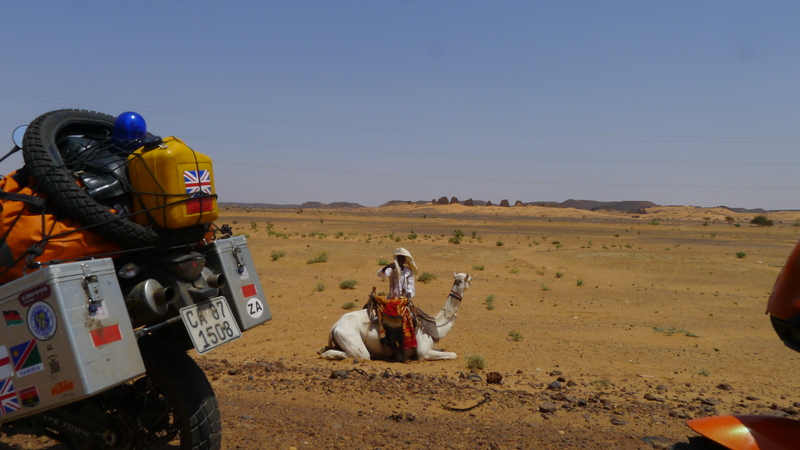 By now it was 9.00 p.m, dark, I was covered in oil, grease, sweat and Nubian desert and I would quite happily have given Fanny away for a cold beer. Whilst sorting the bike Fanny had been busy and found us a place to stay only 50 meters from the mechanics place and had already unpacked all our stuff. It was one of the grimmer dungeons we stayed in, but we didn’t mind. To my mind everything was a complete success and after getting most of the grime off in a mosque foot bath we could relax and get some bread, ful and water, get a night’s kip and get off early in the morning… if, of course, our handiwork was successful. Despite the grubby surroundings and being in an environment as far removed from anything else we had ever experienced we slept soundly. I was up early the next day and checked that the relay was working and that everything else appeared to be in ship shape. 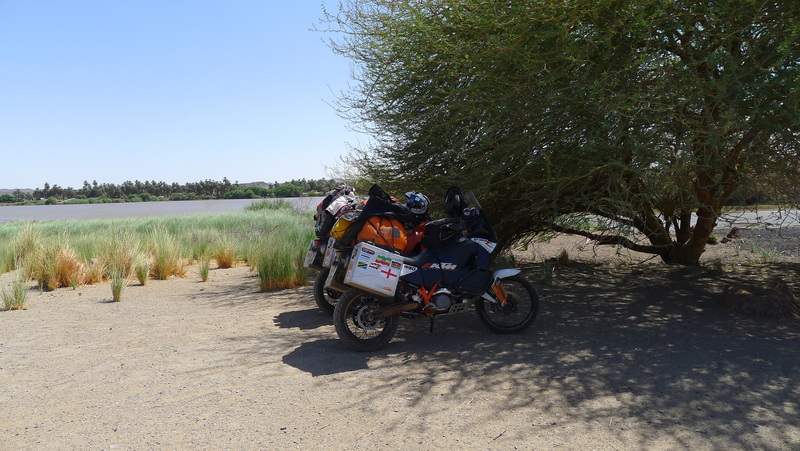 I refilled the bikes with the Steve Thomas filter and we prepared ourselves to cross the Nile yet again and head across another long stretch of desert towards a town called Dongola. 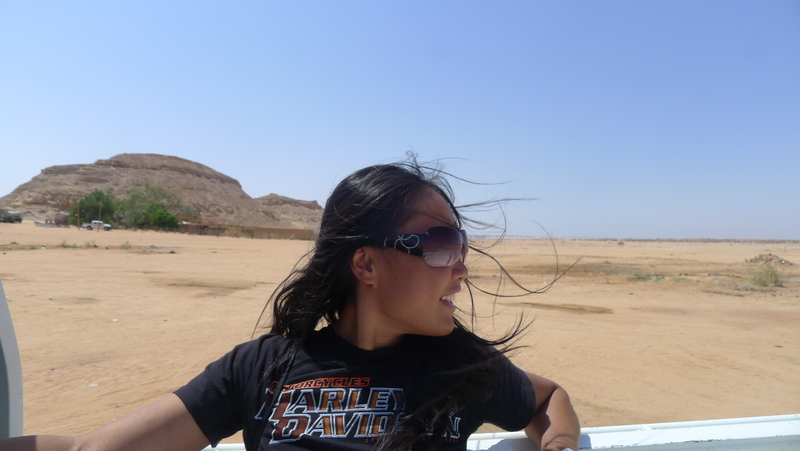 The desert was again spectacular and I reflected on how lucky we were to see it and to ride wonderful motorcycles across it. 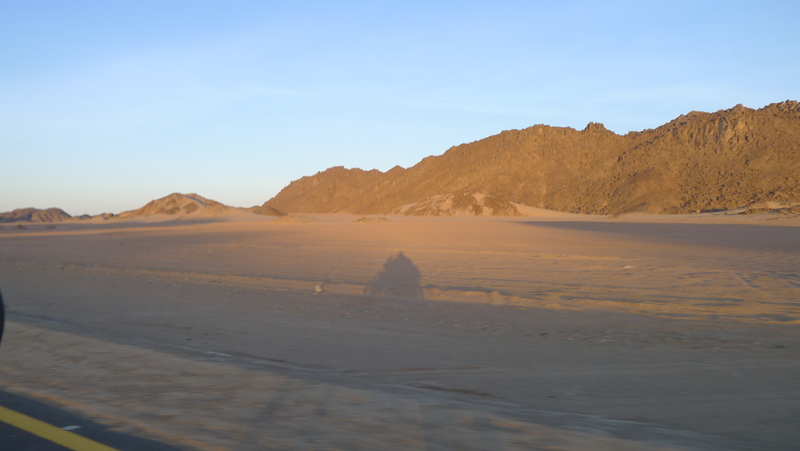 It was definitely not on the tourist itinerary and later when we saw all the red skinned and lardy Europeans ambling around the tourist spots in Egypt, I thought back to this privilege and how unadventurous many people are and what they are missing out on. Unless you are sailing a small yacht in the middle of the ocean you will rarely experience such peace and solitude. If you are a multi millionaire sitting in your office, you are still a human just sitting in an office however much money you have. I remember conversations in the past with high salaried Big 4 and law firm partners who, when not talking about work or networking to get work, would talk about golf, vicious ex wives, other knitting circle members or ways to commit suicide. Their only other activity would be drink and drugs to drown the drudgery and disappointments of the day into a soporific haze. You only have to see the pubs and watering holes that surround the financial centers around the world to see this. Lower down the pecking order, the world’s lab rats sit all day in their cubicles, adorned with cheery holiday snaps of themselves at Disneyland or at the office Christmas party, with “Star Wars” and “Hello Kitty” figurines balancing on their luminescent spreadsheets. They beaver away all day, and often into the evening without a glimmer of recognition for their efforts or a kind word, looking forward to the highlight of the day.. mealtimes. To my mind this must be the place we Catholics call Purgatory. A few enlightened people do live the dream though and this can be achieved regardless of how much money you have, although having some cash does make it easier. Its mostly about attitude and living life to the full. Travel does indeed broaden the mind and there are a million excuses to say ‘No, wish I could, but…” and only one to say ‘Goodbye, I’m off to see the World’. Just before my father passed away he confided in me that he never did do what he really wanted to do in life and for one reason or the other had been rail-roaded towards second best choices and desires. His final words of advise to slow down and smell the roses, and a warning that life is not a dress rehearsal did not fall on deaf ears. 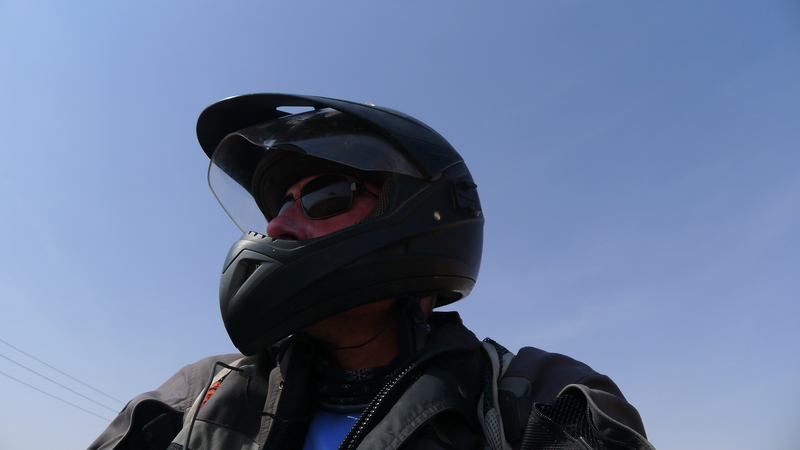 To me motorcycling is about freedom–a modern day way of getting on your horse and trotting off into the sunset. See new things, breathe fresh air, meet new people, face new challenges–and overcome them. 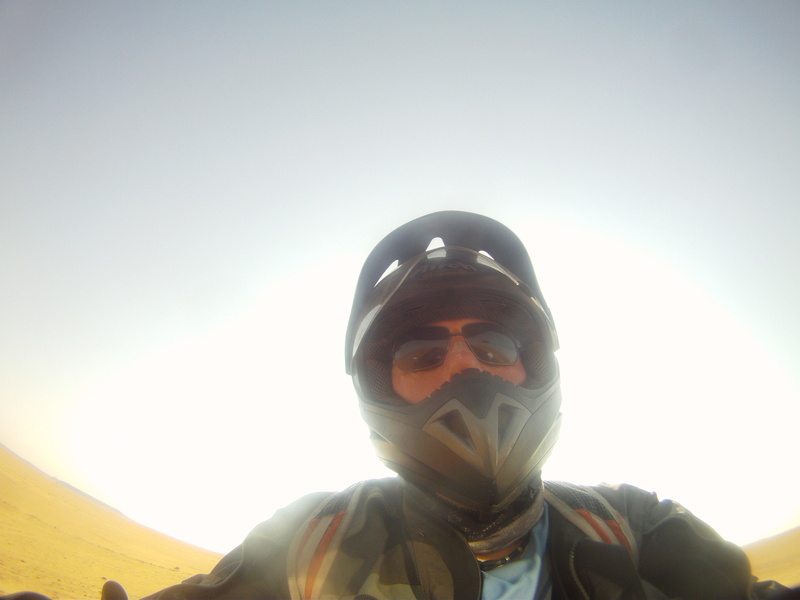 Of course the exhilaration of riding a motorcycle is always a pleasure that I never get bored of. Its never predictable, boring or mundane. The desert crossings were also a time when I would be quite happy in the moment, not thinking about other things, not wanting to be anywhere else. Only paragliding can compare, living the moment and enjoying peace, tranquility and Joie de Vivre. 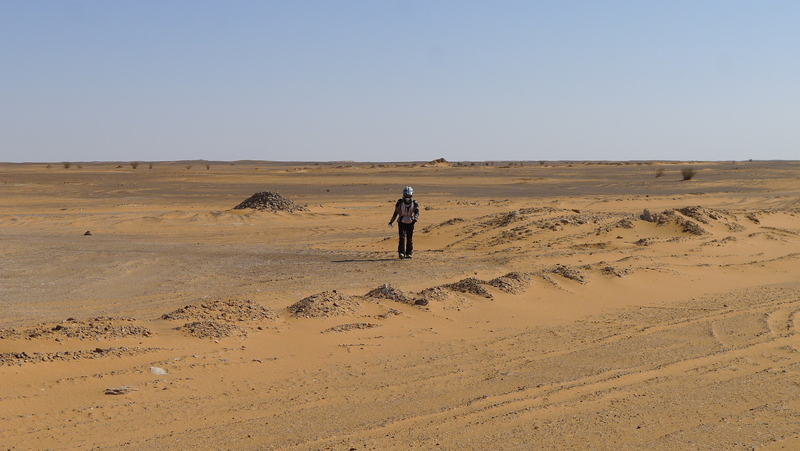 I was a tad disappointed when the pristine white desert we had been riding across started showing signs of green, then electric pylons, mobile phone towers, and then evidence of human activity. 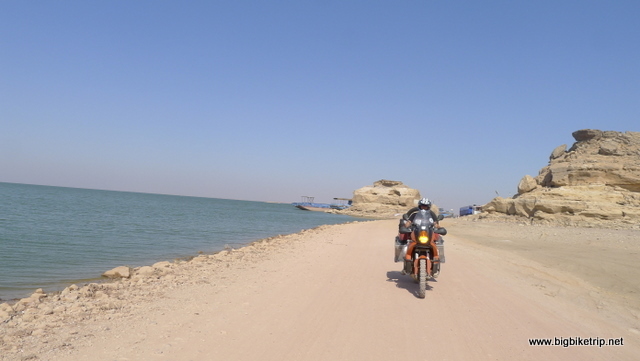 All too soon we had reached the Nile and would follow it all the way to Wadi Halfa where I knew we would encounter hassle and annoyances in connection with getting our motorcycles and ourselves across the border to Egypt. The road was not too bad and the density of towns and villages was less than further east. 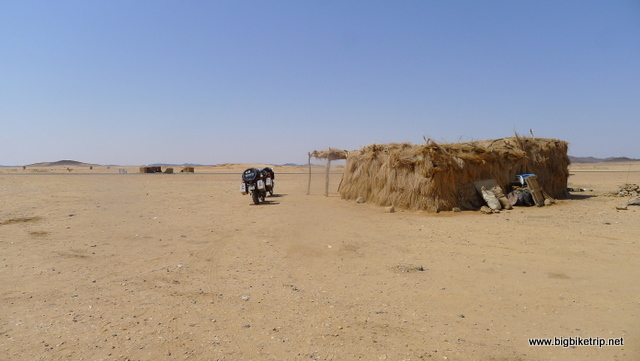 We planned to bush camp in the desert section to Wadi Halfa but as the sun went down we had several unsuccessful attempts to get off the main road as Fanny was very reluctant to ride on deep and soft sand, and every single route to a promising site to pitch our tents required doing so. The only alternative was for me to ride my bike first and then come back and get Fanny’s bike but this was more difficult than it seemed as a fair degree of exploration was needed to find a good spot. 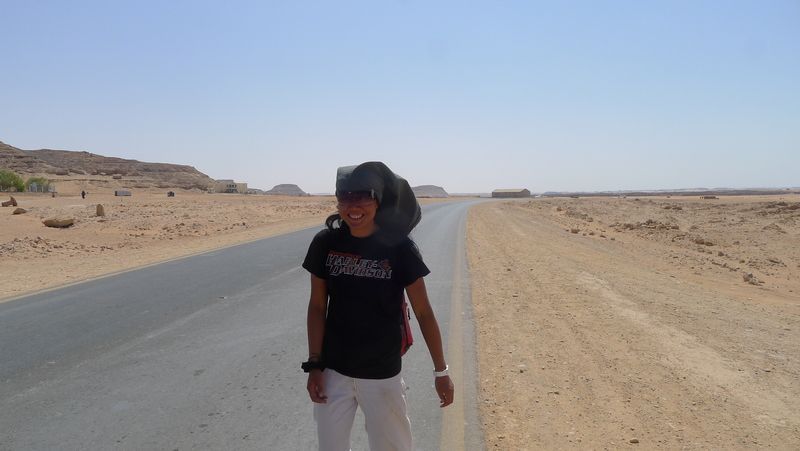 In the end we decided to “plough” on to Wadi Halfa. It has been wonderful riding with Fanny and occasionally we had to confront her riding limitations. 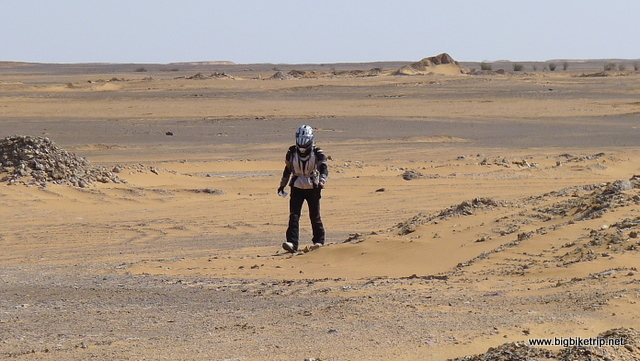 Perhaps one day she’ll race the Dakar as the first Chinese female competitor. I believe she could do it with training and practice. I have never met a stronger and more determined woman. China Dakar team and sponsors take note. A typical camping site making use of a bit of shade for bikes and our tent. 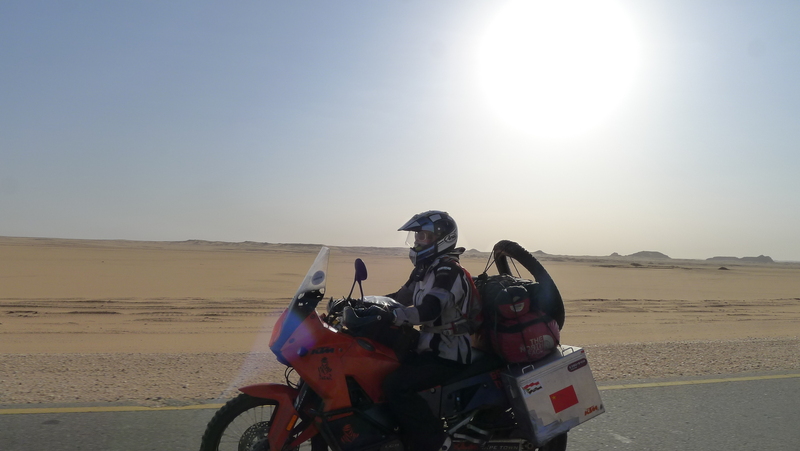 Fanny and her KTM cruising through the Nubian desert. 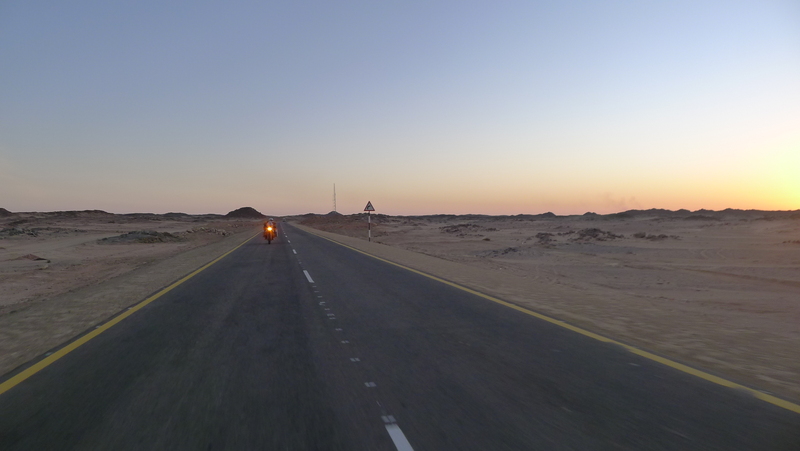 A long ride across the Nubian desert from sunrise to sunset. 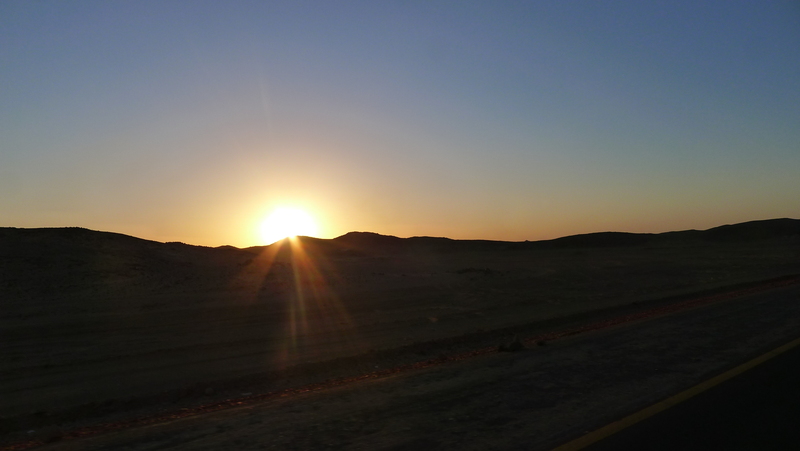 The sun setting above the mountain in north Sudan. 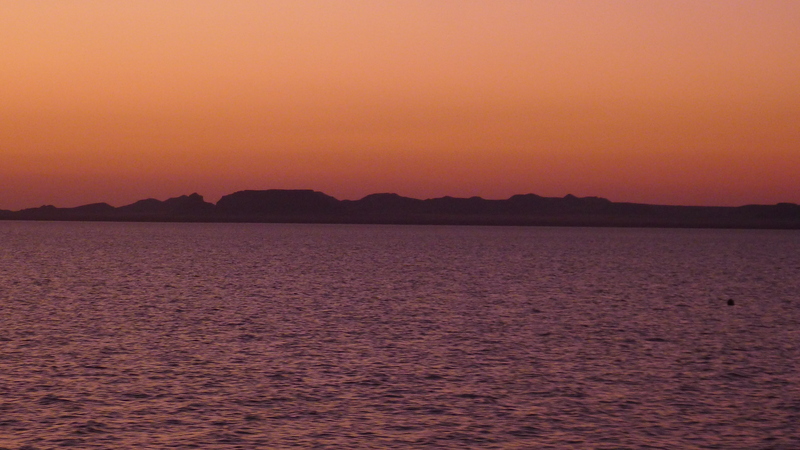 The Nile cuts its way through these mountain ranges on its way to Wadi Halfa where it widens into Lake Nasser, formed by the dam further down river at Aswan, that provides electricity for a large part of Egypt. 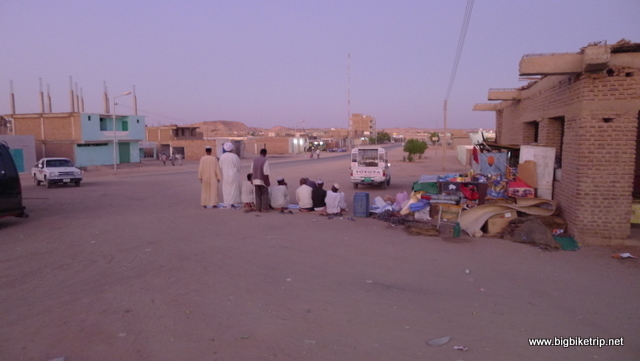 Locals praying as sun setting … . 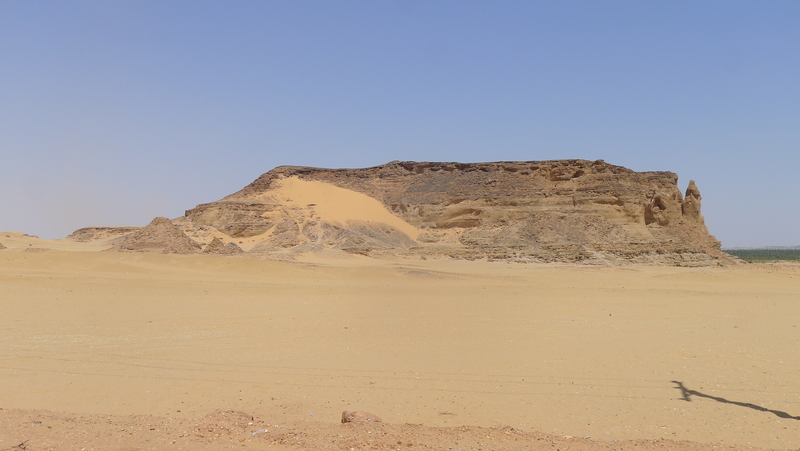 We descended down from the desert mountains and into Wadi Halfa which is the only entry and exit point between Sudan and Egypt. 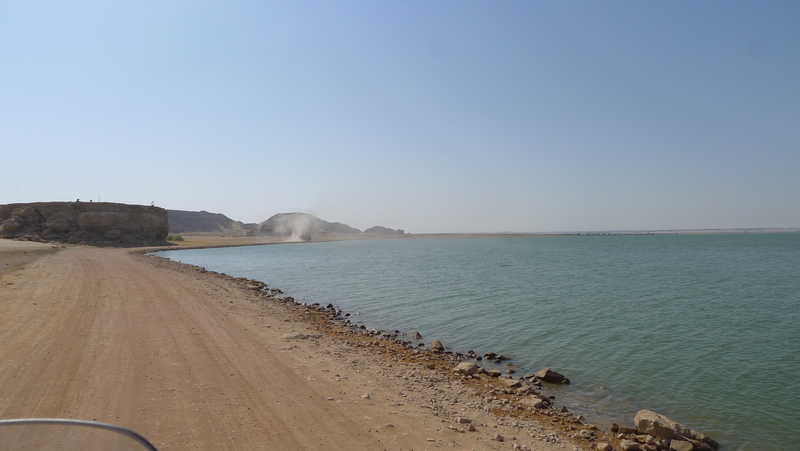 There is actually a huge land border stretching all the way to the coast along the Red Sea, but no one is allowed to cross, despite several new roads being built. We had looked at roads shown on Google Earth along the coast, but we were told they were not open to foreigners. 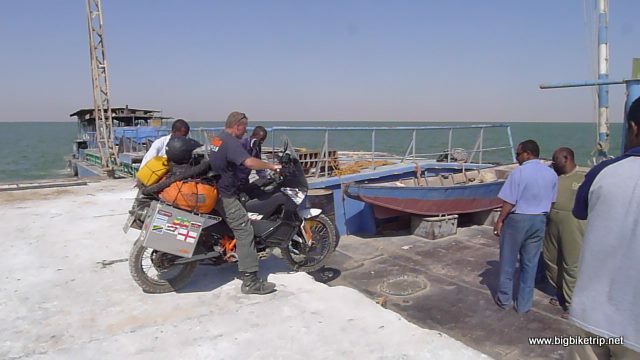 The only crossing was here at this rather scruffy and dusty town on the shores of Lake Nasser where we would have four days to kick our heels applying for permits and waiting for a barge on the Tuesday to take our bikes, and a ferry the next day to take us to Aswan. We booked into the Kilpatra hotel, which was about the only place to stay and acted as a sort of RV point for the document and ferry fixers. The room was pretty bleak and dirty, but the outside bathroom was absolutely disgusting and made me gag each time I had to go in. In the end I disobeyed the out of bounds sign and used the women’s bathroom which was only slightly better. I have seen worse in China, but I never had to experience such a bad one for more than 5 seconds before I hastily retreated and made alternative arrangements. But here we were stuck with this revolting hole, something on this planet only a human could create and tolerate. It seemed the management of Kilpatra hotel don’t eat pigs, but they seemed perfectly happy to live like one. Strange. It was pretty hot and the room had no fan and no windows. Fanny being a woman was not allowed to sleep outside where all the men put their beds at night and so we soldiered on, spending as little time in the hotel as possible and suffering somewhat at night. On reflection we should have camped outside the town, but it would have been inconvenient given all the admin we had to do. Most of the time we got it right, this time we didn’t. 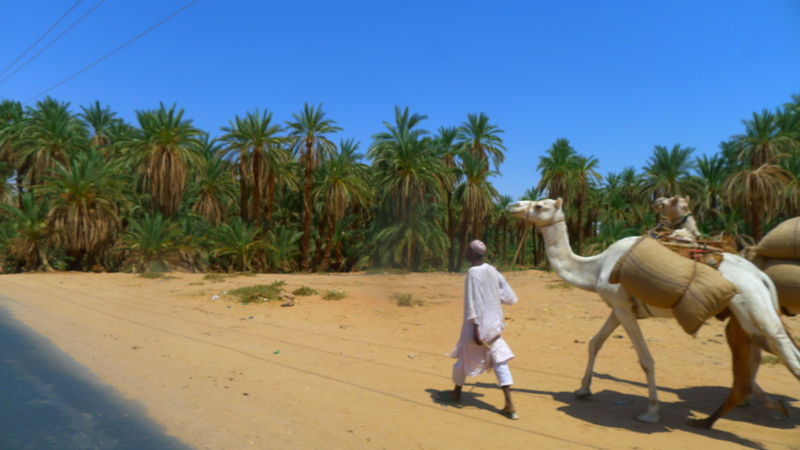 Apart from the hotel I got to quite like Wadi Halfa. We had fried fresh fish each morning; ful and falafel each night; there were stalls selling fresh fruit juices; a few nice walks to go on; we could use an internet cafe to contact the outside world; watch movies at night on a communal TV, provided it wasn’t showing thousands of people walking round and around a big cube in Saudi Arabia; and we met all sorts of other travelers who had gathered at this bottle neck. There was no other way to cross between Sudan and Egypt at that time. New roads had been built, but they were controlled by the military and were not for public use and so the ferry, which takes eighteen hours, was the only way. 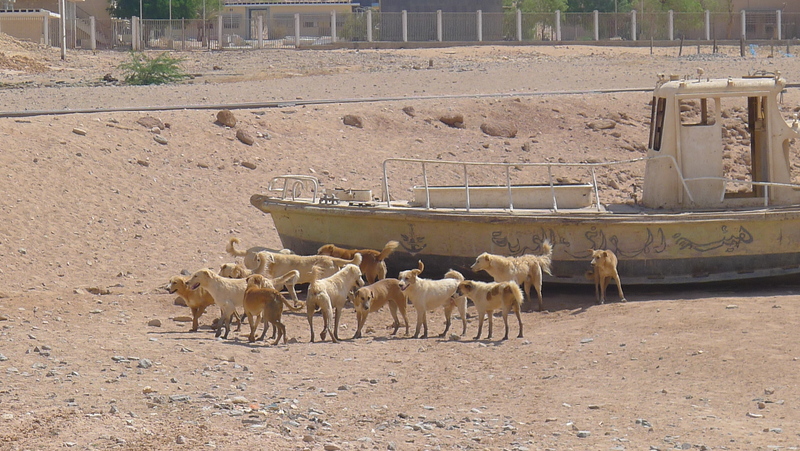 The Nile is dammed at Aswan where there is a hydro-electric power station and the lake (Nasser) extends as far as Wadi Halfa where the ferry’s and barges are moored and where there is a chaotic immigration and customs building, police station and a military base. Pretty basic stuff. 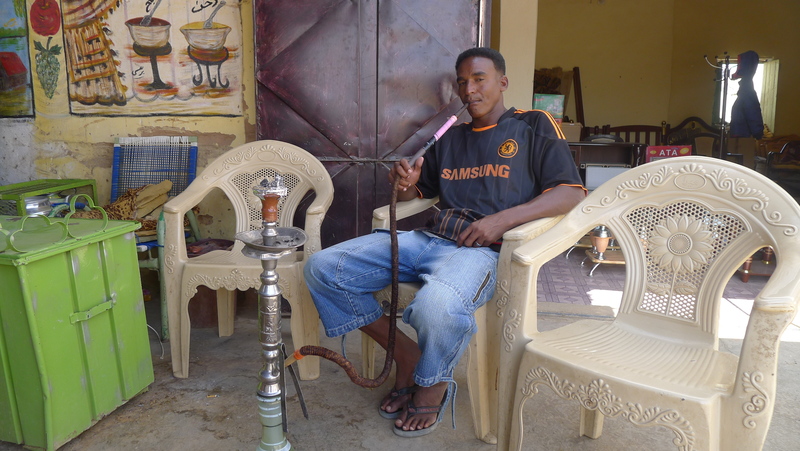 Our fixer who we contacted in Khartoum was called Magdi, but his estranged cousin Mazaar turned up and there was some confusion about who was doing what and looking after us. Some kind of fixer turf war. 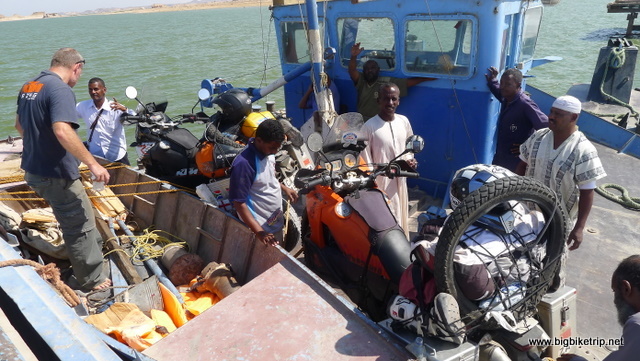 In the end I handed all our documents, passports and fees to Magdi who turned out to be very efficient and arranged for the bikes to go on a barge on the Tuesday and for us to go on the ferry the next day. 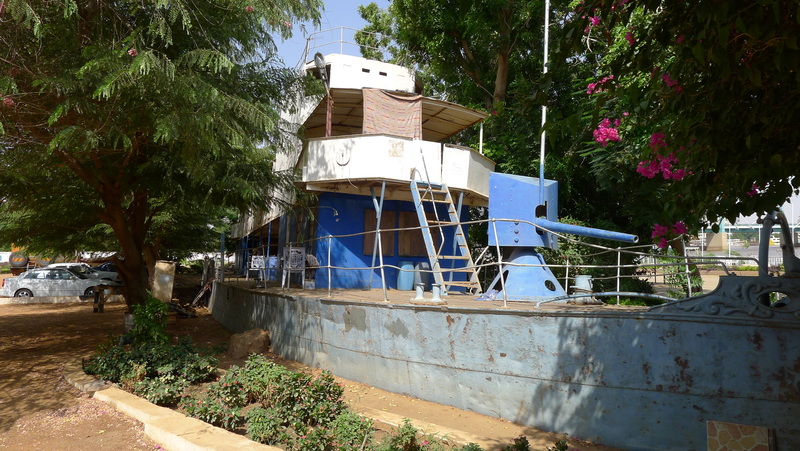 We bought the cheapest seats available which meant we had to camp on the deck which wouldn’t be too bad for a “Night Boat Up The River Nile”. 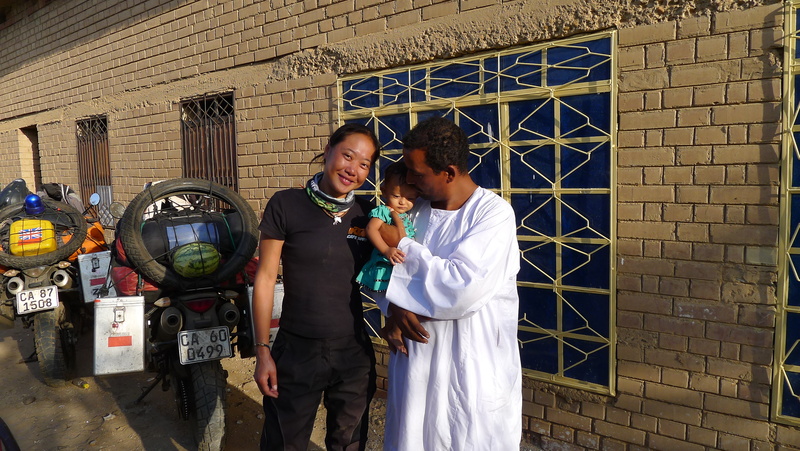 Fanny and our friend, Antoine from South Africa who had cycled across the African Continent and like us was waiting in Wadi Halfa for the ferry. 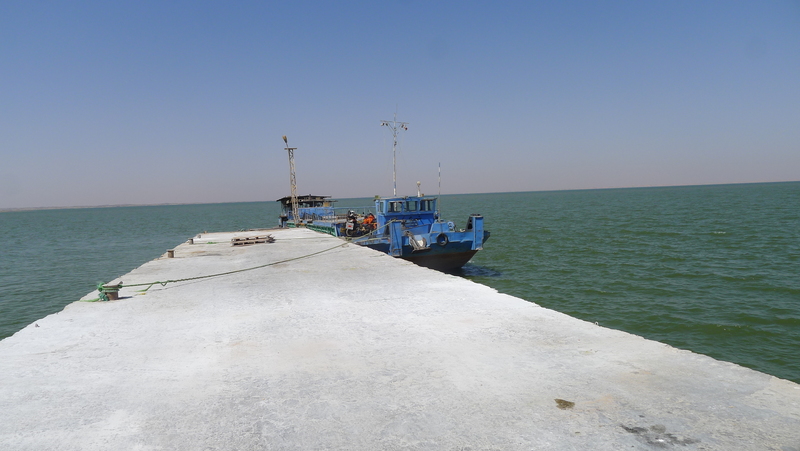 Taking our customs fixer Magdi down to the barge jetty with me … perched up on the bags. Securing bikes on the open deck with whatever I can find. 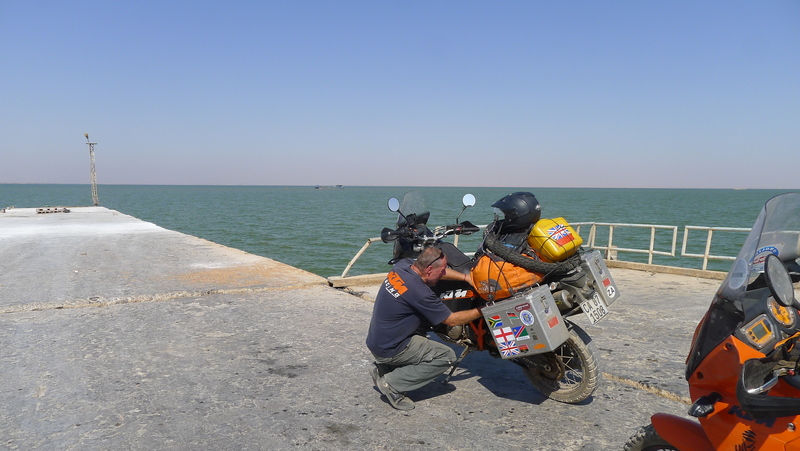 The Nile looked calm at the moment, but it was not uncommon for storms to break out and for Lake Nasser and the Nile to become quite choppy and so it was important the bikes were firmly strapped down. Lining up the bike … I had to wait for gap between barge and jetty to narrow and also for the barge to lift slightly in the swell so the belly pan didn’t scrape over the edge ….. Its all in the timing. Of course the KTM with its Touratech belly pan is as tough as it get which is why we were riding them. 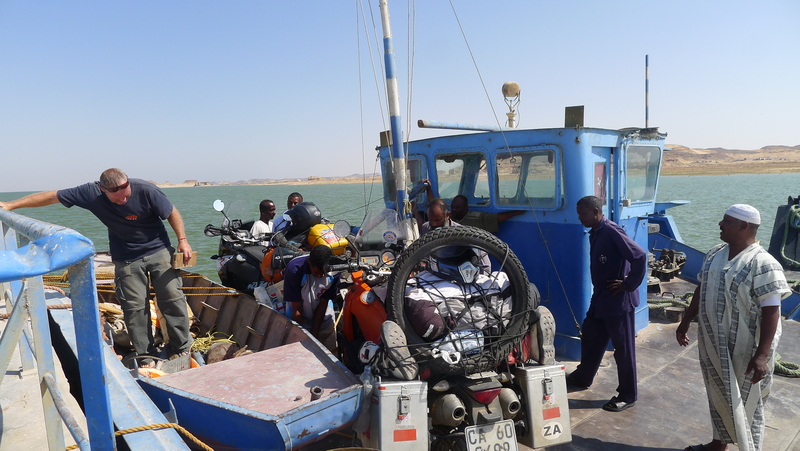 Our ferry that will transport our motorcycles up the Nile. We will take a passenger ferry the next day. Making sure bikes and all our riding kit is secure We were only going to carry valuables and a light bag onto the ferry so everything including our riding gear and boots and helmets was secured onto the bikes or locked in the panniers. The barge which the bikes were to go on wasn’t really designed for vehicles and I had no idea what it was actually carrying, but I was grateful we could get them on a boat to Aswan cheaply, which left the interesting task of actually getting the bikes physically onto the barge and securing them. The usual loading dock was not designed for drive ons, being too low as cranes were used for the cargo and so for a small facilitation payment the Captain agreed to move the barge to a pontoon a kilometer or so upstream where I managed ride the bikes off the edge of the pier and plunge a couple of feet down onto the deck without too much trouble. 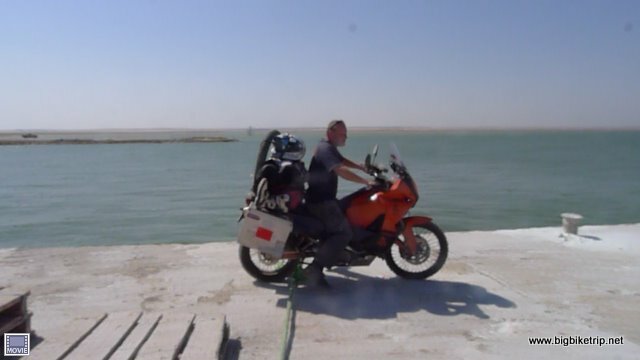 My Adventure R had no problem as the suspension is high, Fanny’s bike has a little less ground clearance and so the plunge off the edge had to be timed to when the barge was closest and at its highest. With a firm hand I helped with and supervised the securing of the bikes behind the wheel house and then we waved goodbye as our only possessions disappeared in the hands of Captain Hamada and his crew of strangers to hopefully arrive in Aswan on the following Thursday, the day when we were also scheduled to arrive on the passenger ferry. A big dose of trust was needed in such a situation, and perhaps a prayer. 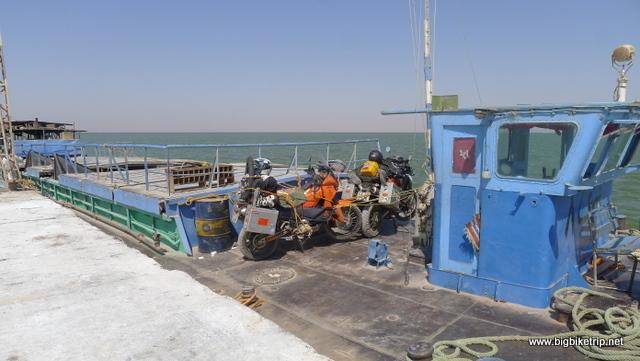 We had of course ridden our bikes to the ferry and had to walk back, but not without shaking hands with every single customs, immigration, police and army person. I had used up a few “I used to be a policemen” credits to smooth things along and this resulted in dozens of handshakes and back slaps before we could escape and walk back across the desert to the town and relax until the next day. 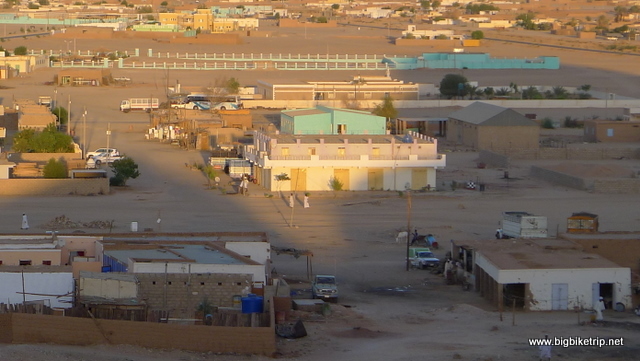 As we were hiking across a barren and scruffy bit of sandy desert between the shores and the town a pick-up truck pulled up alongside us and inside was one of the custom officials and he kindly gave us a lift back to town in the back of his truck. Back in town we had a dinner with some of the fellow travelers we met. Antoine from South Africa had ridden his bicycle all the way from Durban, only taking a flight from Kenya to Sudan as he was not allowed to ride through South Sudan, but he had pedaled across all the deserts, starting very early each day, resting from eleven until three when it was hottest and then cycling again through the late afternoon and early evening. Amazing stuff and if you want to lose 20 kilograms try it yourself. There was also an “over-lander” truck that had started its trip back in Cape Town, one of the very few overland trips that crossed the whole of Africa. Later, the truck would go missing for a few weeks in Egypt due to the vehicle barge breaking down and some dodgy customs shenanigans. We very nearly took the same barge, but I did my homework and over some coffee I was educated about the way things were done and correctly made the right choices. There were also some guys who were backpacking around the world using public transport and had some amazing tales to tell. One from the French bit of Canada and another from the USA (brave guy, although he looked middle eastern and spoke Arabic). 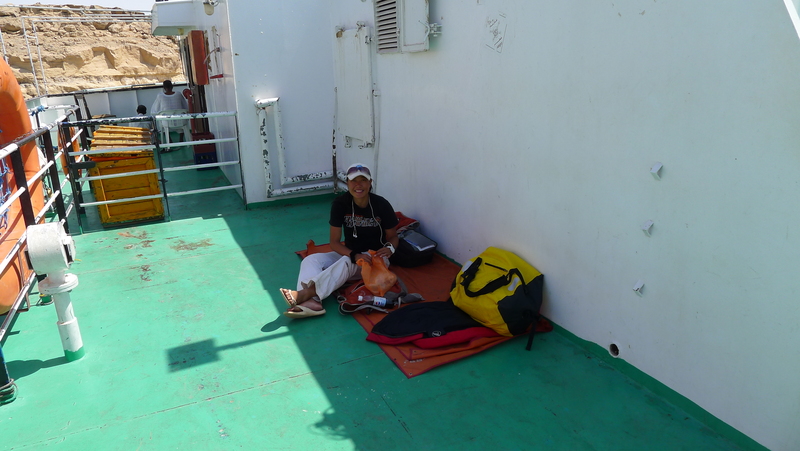 The next day we boarded the ferry and due to pulling some strings we got on first and secured the best position on the deck, laid out our sleeping bags and settled in for the eighteen hour ride to Aswan. 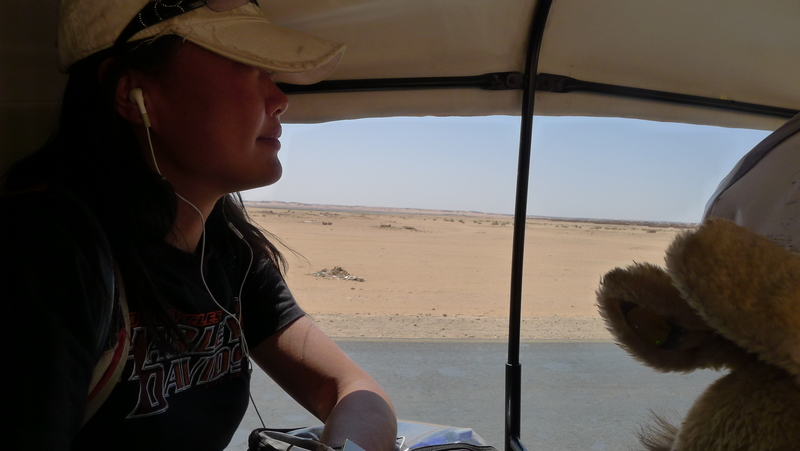 I still didn’t have an Egyptian visa in my passport, but importantly the bike documents were all in order and we were onboard. Three hours later, in the middle of the Nile we saw a small speed boat approach, some documents were exchanged with some officials and we were told we were now in Egypt. Great, I thought. Right, where’s the bar? Inspecting the bikes and wondering if I’ll ever see them again. 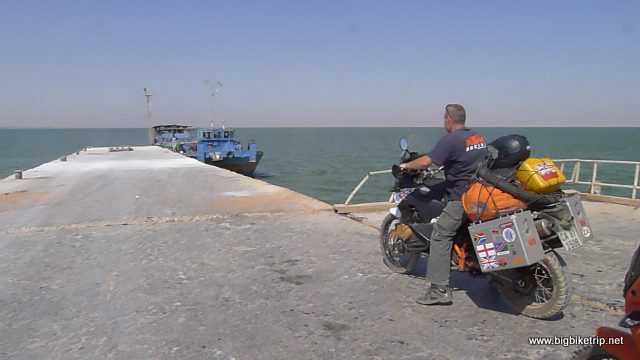 KTMs now all secured on the barge next to a jetty in Wadi Halfa on which they will travel up the Nile to Aswan in Egypt. I hope. As expert campers we have secured the best bit in the shade on desk that will also protect us from a rather strong and surprisingly cool wind during the night. Settling in and enjoying the sunset. Wondering where the bikes are though… they have 24 hours head start on us. 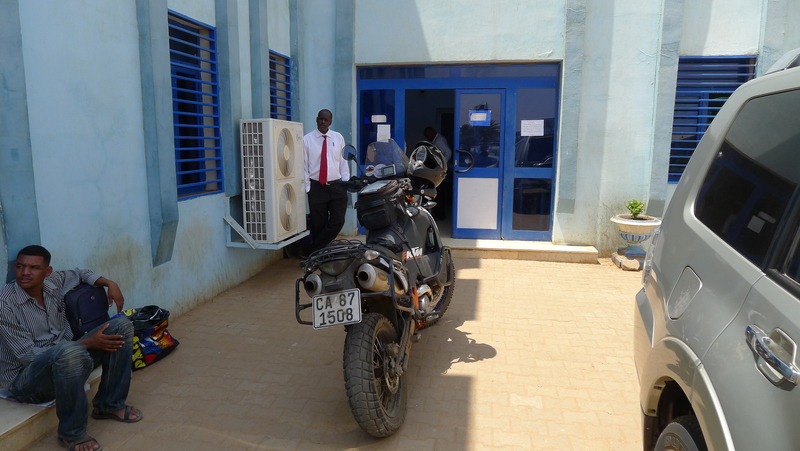 This entry was posted in Africa, Fanny, KTM, Mechanics, Rupert, Uncategorized. Tagged 990, Addis Ababa, adventure, Africa, Arniston, Atbara, baboon, Bedouin, bigbiketrip, Blue Nile, Bono, bush mechanic, camel, camping, CF Moto, coffee, crocodile, Fanny, ferry, fruit juice, ful, Islam, Jebel Barkal, Khartoum, KTM 990 Adventure, Lake Nasser, Meroe, Mohammed, mosque, motorcycles, National Camp, Nile, Nubian desert, Pyramid, Rupert, sand dunes, scorpion, snake, Starbucks, starter relay, Sudan, Wadi Halfa. “tomatoes, cabbage, onions and chilis all we saw was a bag of hot slime” Mmm, nice spicy soup. Good reading, great adventure, Thanks.